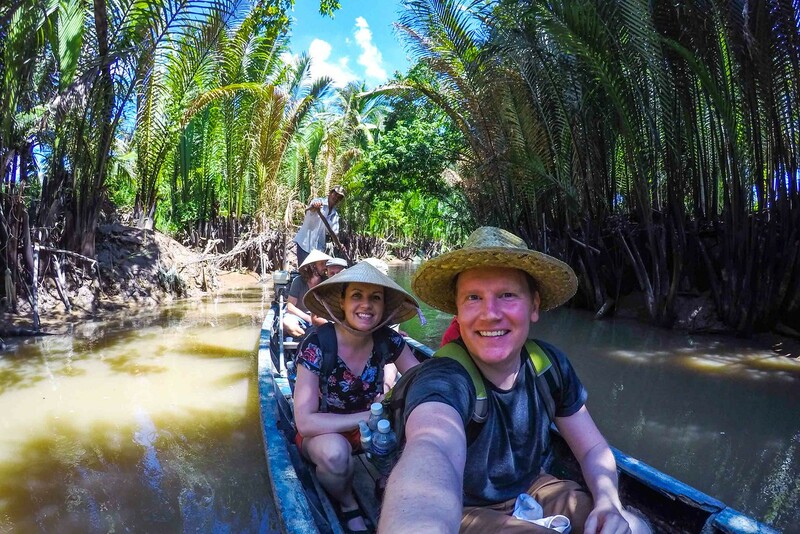 A One Week 'DIY' Mekong Delta Adventure! As we chugged along the river in our small engine powered boat, we sat amazed and fascinated by the sheer amount of activity going on around us. 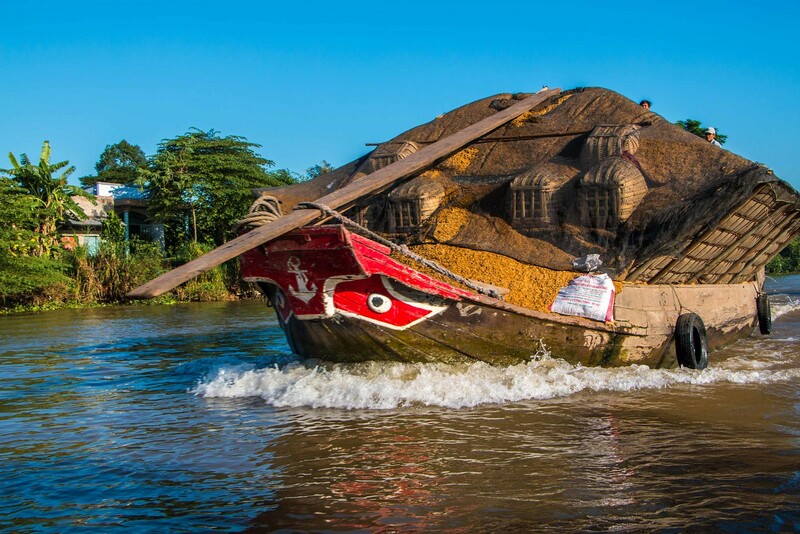 From small rustic canoes, occupied by farmers transporting their freshly picked herbs or vegetables to market, to large wooden barge ships packed so full of rice they looked as though they were sinking(! 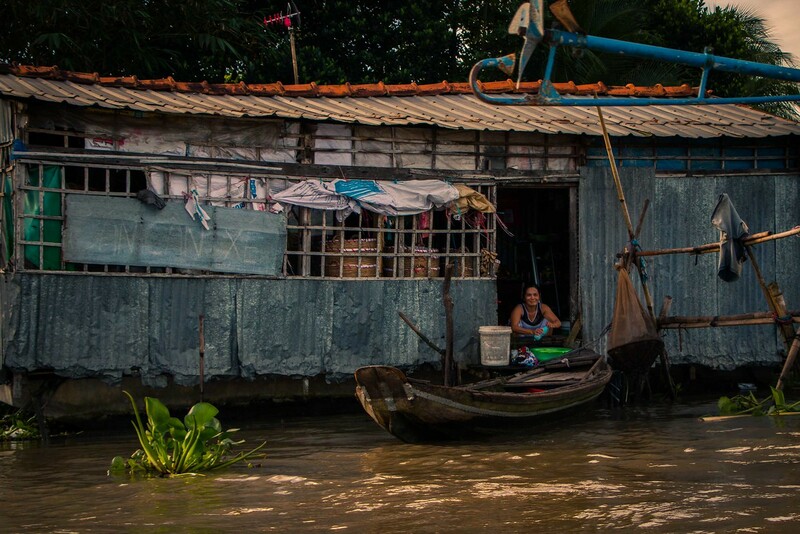 ), the river is a throng of activity and the lifeblood of the Mekong Delta. 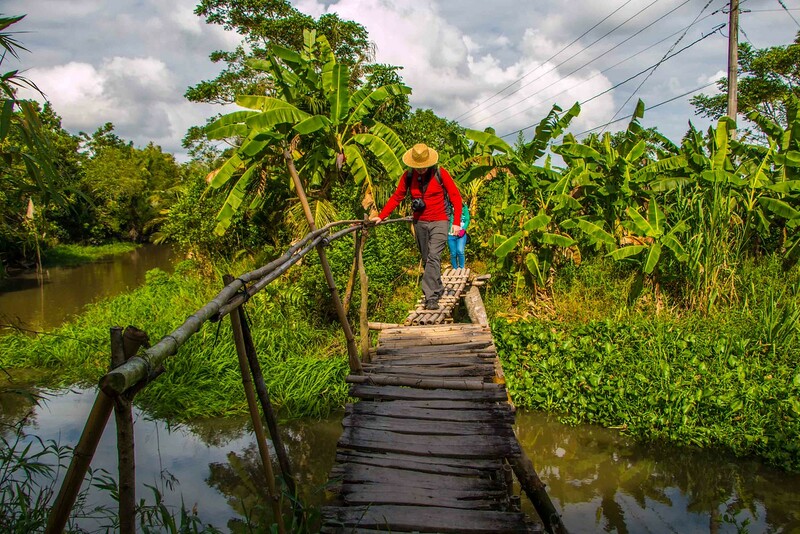 There are so many routes and destinations to choose from in the Mekong Delta, and it can be tricky to decide where to go and how to get there. So before we delve into our highlights and experiences, here is some practical (and hopefully useful!) details about our route. After lots of research and deliberation, we eventually decided on a route to the Mekong provinces of Ben Tre, Vinh Long and Can Tho. Why? Firstly because we felt that three destinations provided enough for roughly a week without being too busy, and secondly because we wanted variety! Each of these places offered a different experience along the way, both in terms of activities and environment. 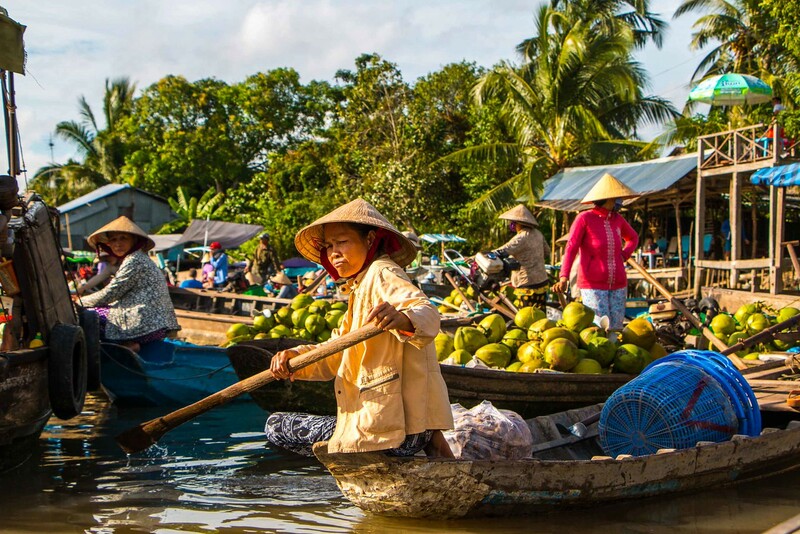 We picked Ben Tre province for its abundance of fascinating coconut factories (as well as brick factories) and peaceful canals, Vinh Long province for an authentic homestay experience, and finally Can Tho city for its famous floating markets and picturesque rural canals. We were not disappointed! This route can be done as a round-trip loop without repeating any journeys. 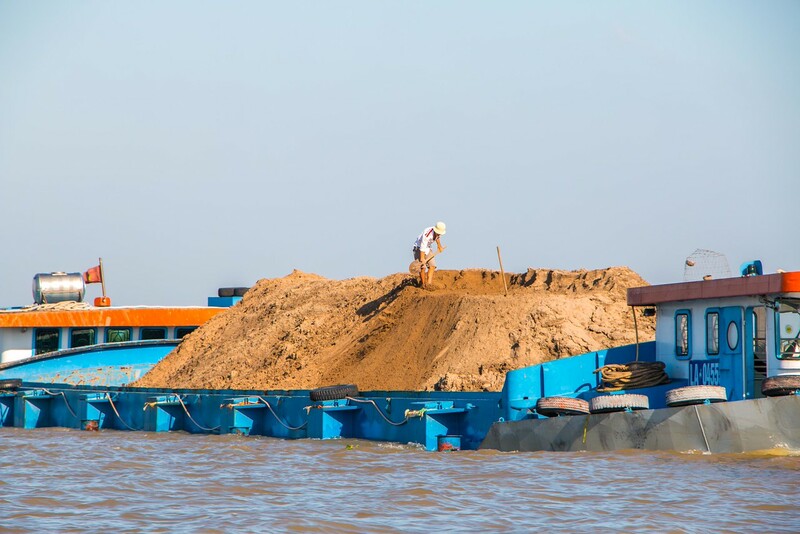 It’s possible to travel overland (and/or by boat) through the Mekong from Ho Chi Minh City (HCMC) then either return to HCMC by direct flight from Phu Quoc island or fly directly to Hanoi from Can Tho. 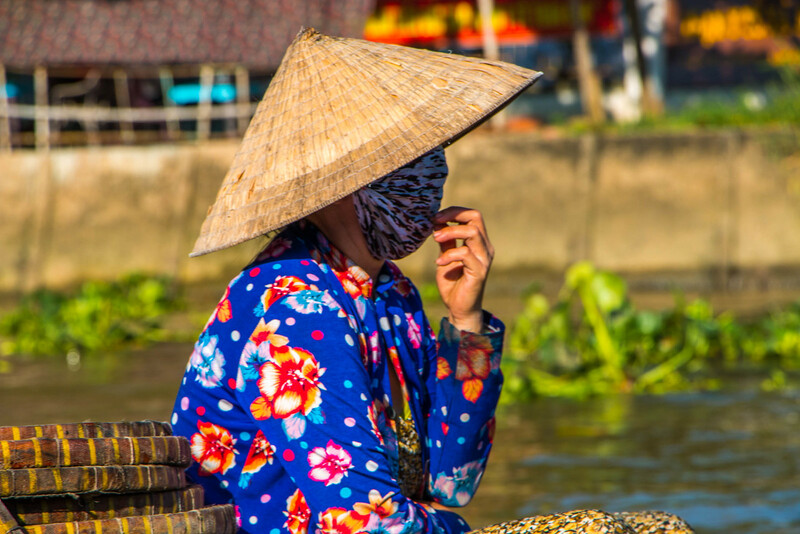 There are plenty of cheap tours available from Ho Chi Minh City, however we’ve heard mixed reports about these such as large coaches going only to very touristy parts with poor accommodation included, so if you’d rather be ‘in control of your own destiny’ (like us!) then we’d recommend opting for a ‘DIY’ tour such as ours. Despite some initial apprehension in doing it this way, it turned out to be quite easy to arrange and a very rewarding experience so we’d highly recommend it! We’ve also included a full summary of how we got from place to place at the end of this article. We covered quite a lot of ground (and water!) 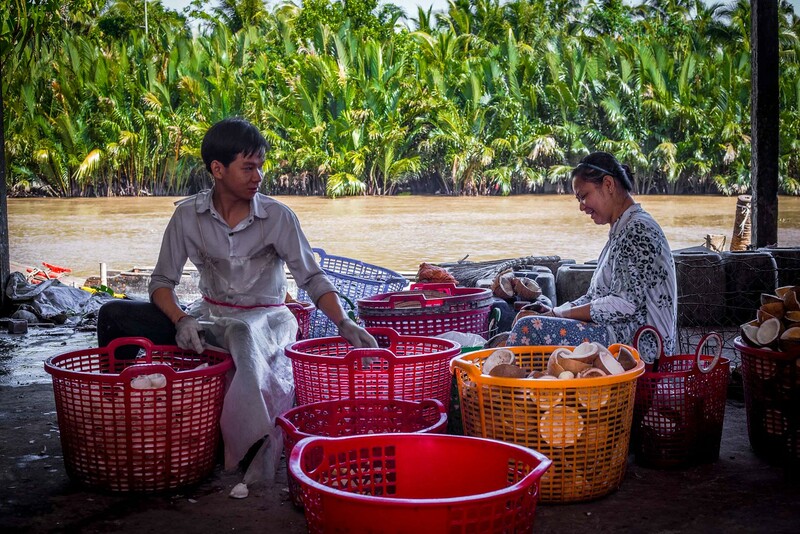 during our one week ‘DIY’ adventure in the Mekong Delta, so rather than detail every part of the journey, here are our highlights in a series of short photo essays and stories, we hope you enjoy! 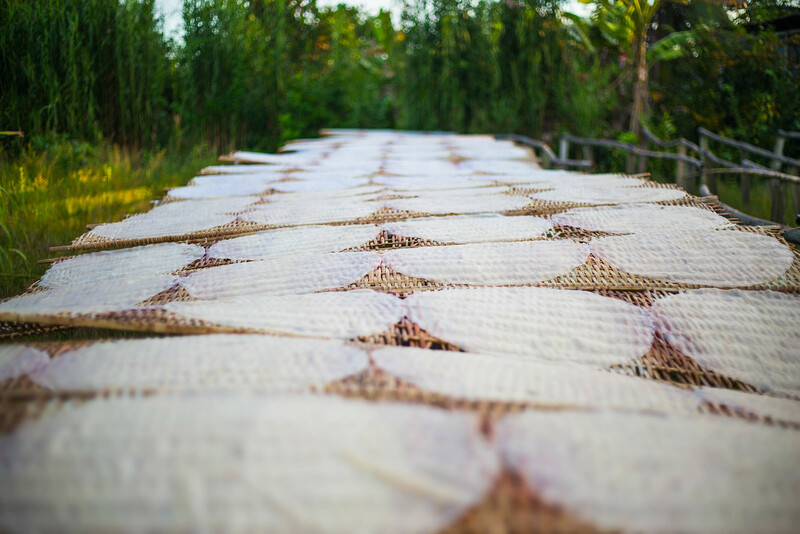 As Vietnam’s premier coconut growing region, Ben Tre is a quiet province in the Mekong most famous for its coconut production. 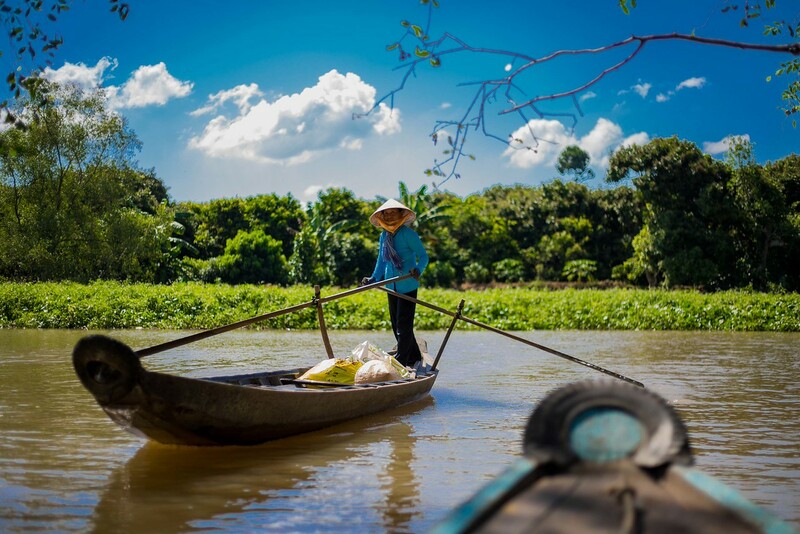 Being a little ‘off-the-beaten’ tourist path, it’s quiet compared to some other destinations in the Mekong, making it a great place for a more peaceful and serene boat trip. During our visit there, we took a tour around its fascinating local factories, rivers and picturesque canals, and here are the highlights. Beautiful palm trees & coconuts galore! 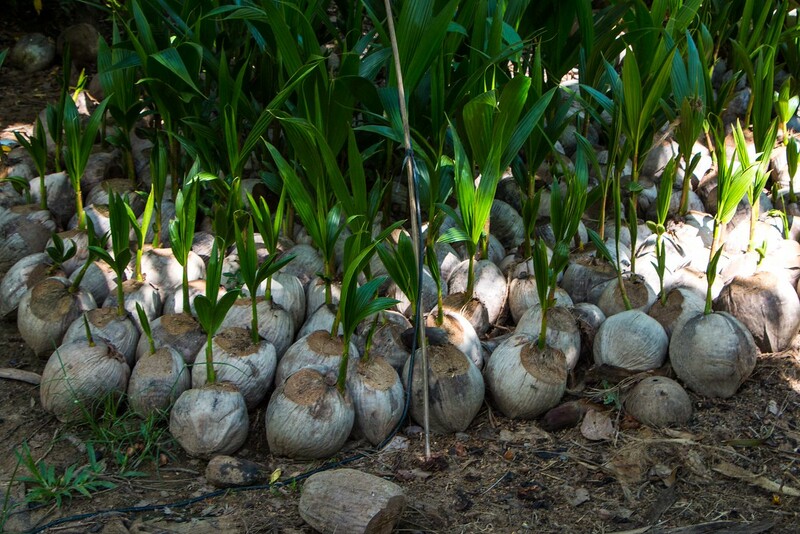 It’s easy to understand why it’s nicknamed ‘The Land Of Coconuts’ (or ‘Xu Dua’ in Vietnamese)! 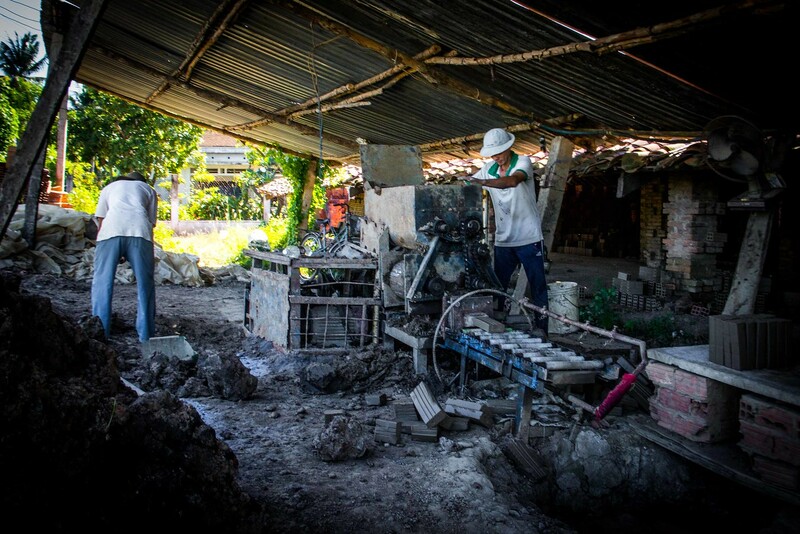 Putting aside our coconut passion for a moment however, the first stop on our half day boat tour was in fact to a local brick making factory. Little did we know this would be the most fascinating visit of the whole tour! 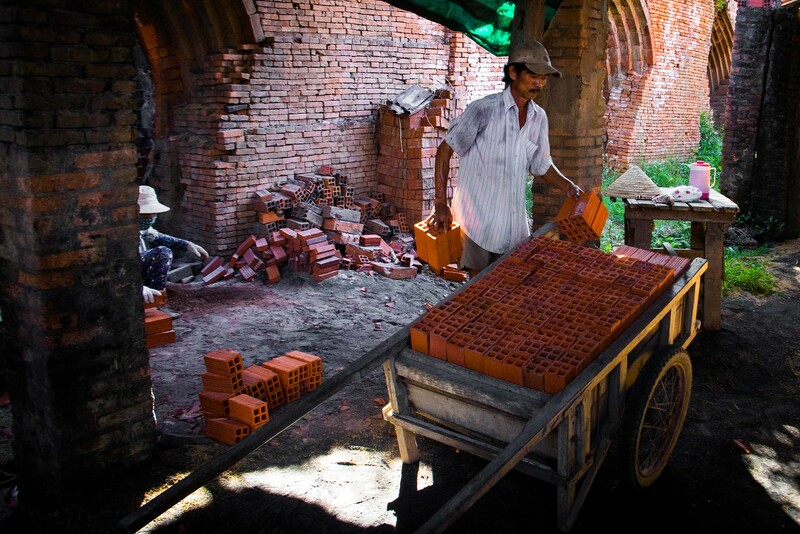 Touring the local brick factory was a fascinating and humbling experience. As we walked around, meeting local workers along the way, our guide explained to us the long, hard and rather dangerous process involved. 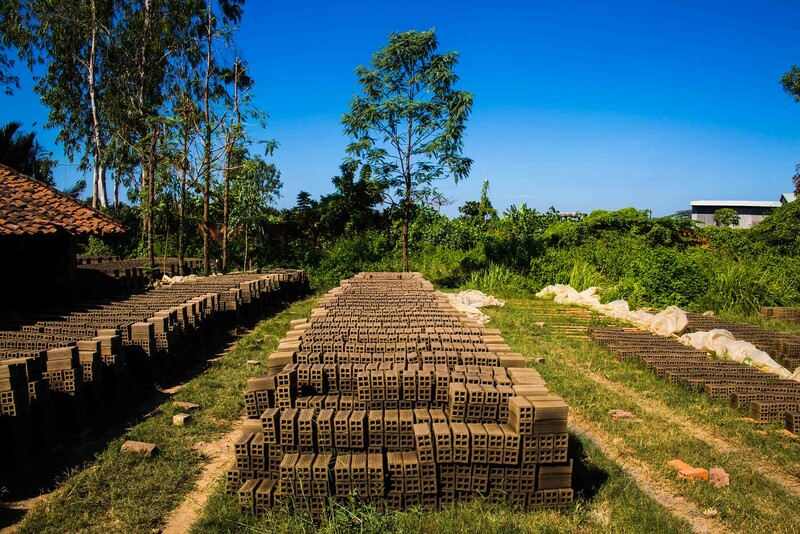 From the collecting of the river clay and moulding/cutting of each individual brick, to the highly manual process of transferring every single brick (by hand!) 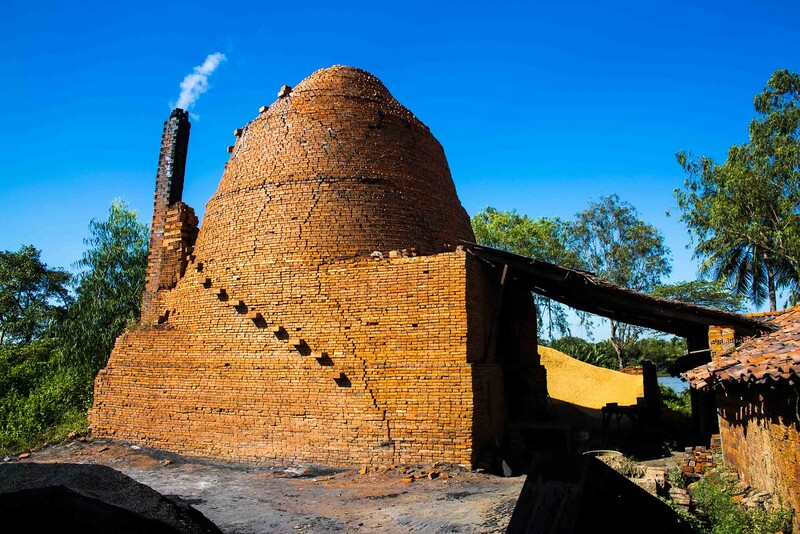 into the massive 20,000 capacity hot kilns for a 2-week cook, it’s back-braking work. 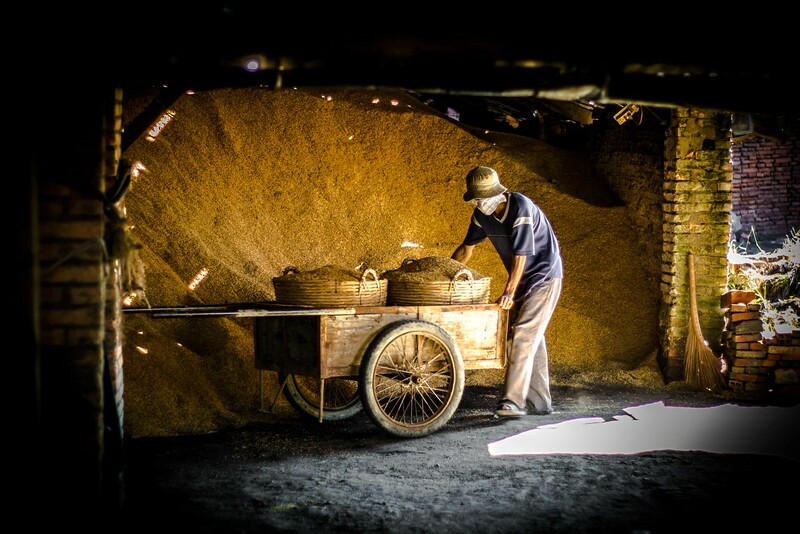 Never mind the constant shovelling of rice husks (every 15 minutes) to keep the kiln fires roaring at their 1,000 degree temperatures for 2 weeks at a time! It’s a relentless physical process. 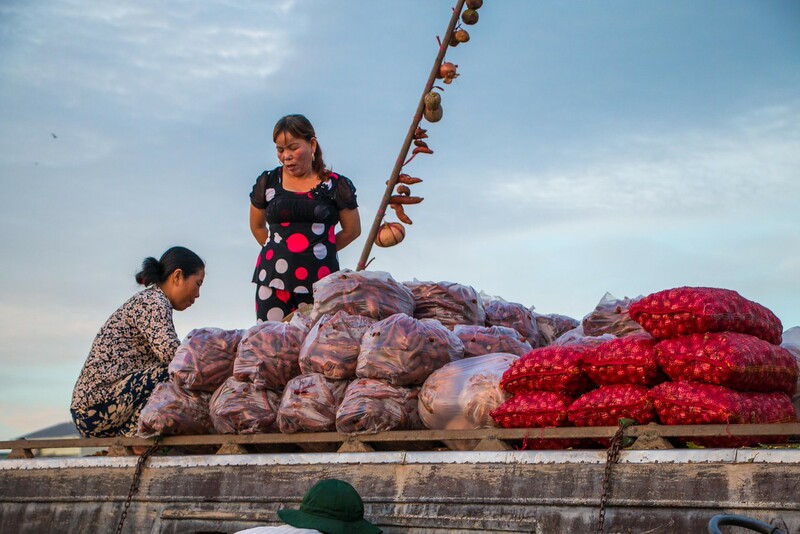 Despite all of this hard work and the long hours (typically 12 hours a day we were told), the labourers are paid based on production rather than time, so the pressure is constantly on to work as hard as possible, despite the minimal pay. It’s experiences like this on our travels that make us appreciate what we have and how hard life can be. We left the brick factory with the highest respect for these hard working people and of course, a whole new appreciation of bricks! 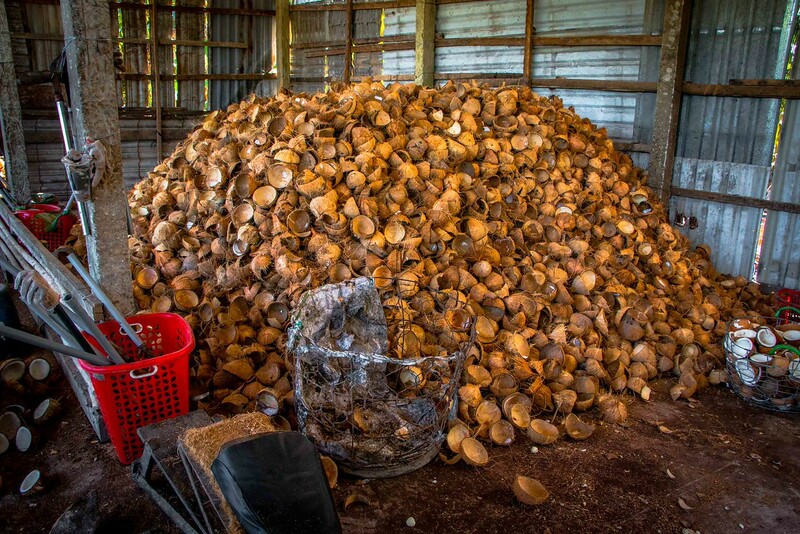 The next two stops on our tour brought us to the staple businesses of the local area, coconut production. 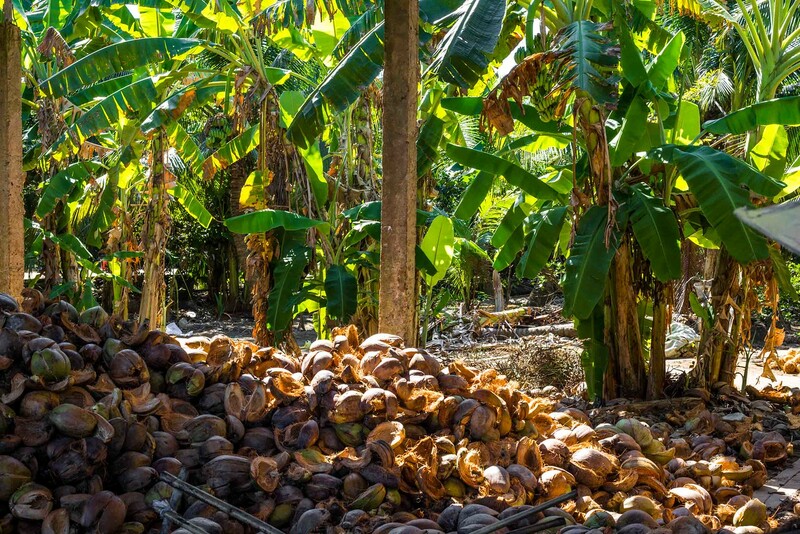 With such a huge supply of coconuts, there are lots of factories in this area manufacturing coconut products. 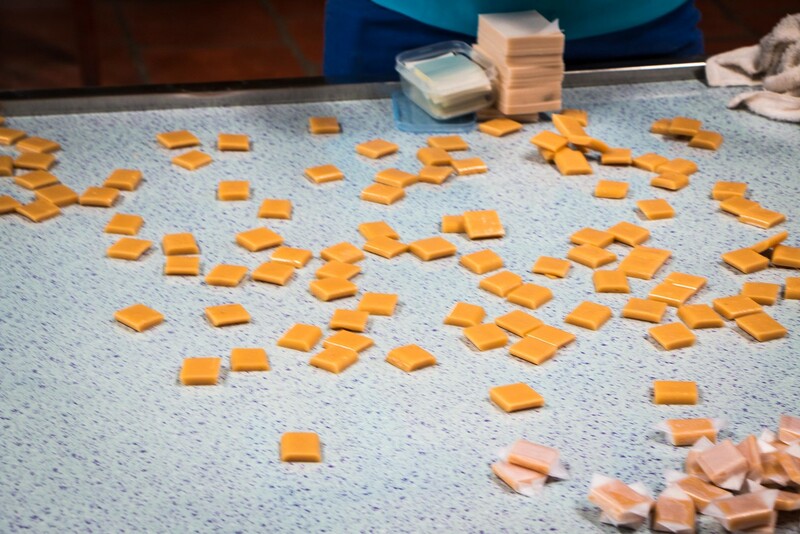 From coconut candy to savoury snacks, you can find all sorts here so we visited this riverside factory to see how it all worked. The simple factory, perched on stilts by the riverside, was intriguing. We watched in fascination as the men expertly cut the shells whilst the women carefully carved out the flesh of the inside. 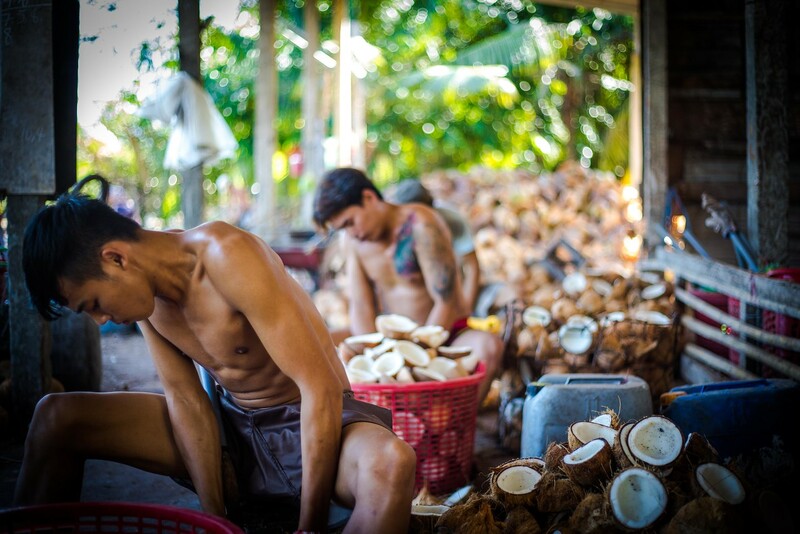 The speed and precision at which they hammered through each coconut was amazing. But it was all about speed, as again our guide explained how their wages were calculated based on their individual production volume/weight. Wow. Although not as physically back-braking as the brick factory, it was clear how hard the locals had to work and usually for long hours. Yet despite this they never failed to raise a smile and say hello whilst we toured around to learn their processes. Once again we were grateful and humbled by our experience, and the resilience and friendliness of the Vietnamese people never failed to amaze us. We also learned about the various uses of the coconut and sampled our first Vietnamese coconut candy, it was delicious! 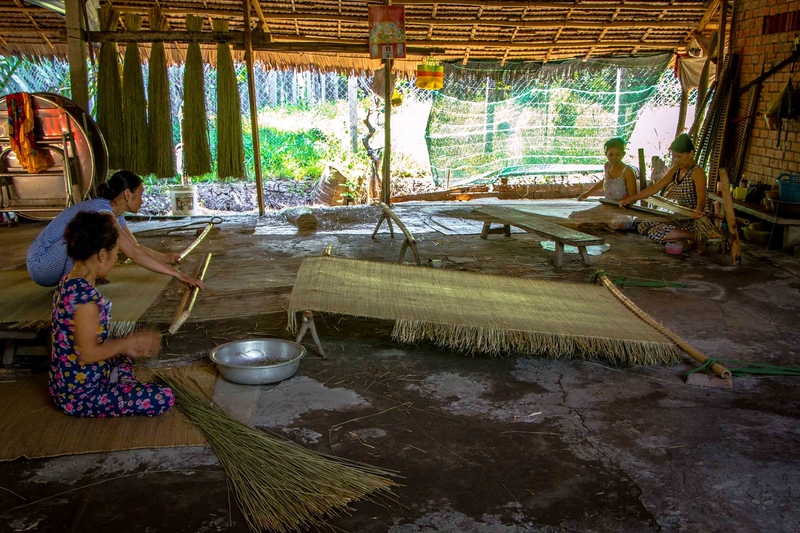 The final place on our Mekong tour around Ben Tre province brought us to this small homemade weaving factory, where we were shown how the locals skilfully work their hand looms to produce all kinds of beautiful mats, hats and bed bases. They worked so fast and expertly that we could hardly see each row being wound! 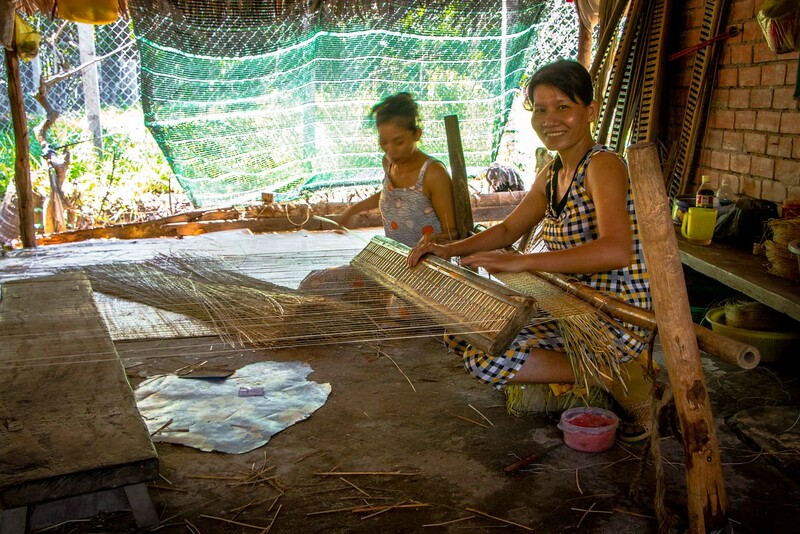 Here are some of the highly skilled locals in action! 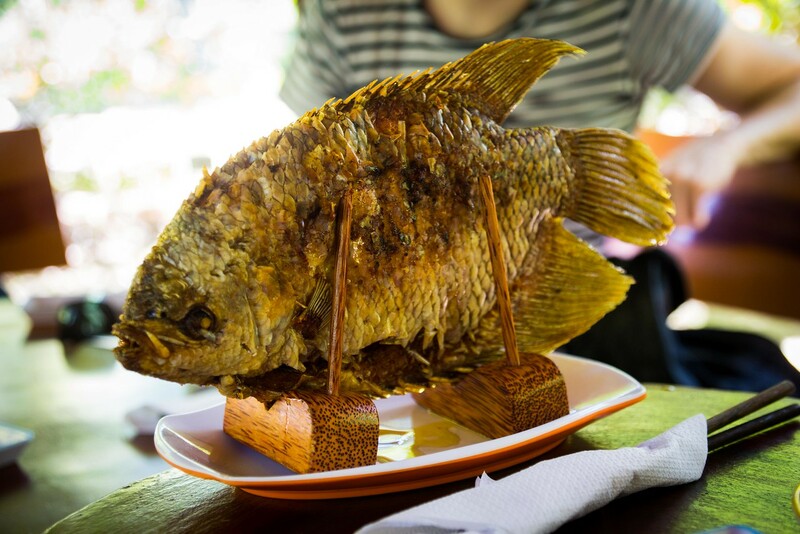 After our visits to the various local factories, we finished our tour with a lunch in the jungle near the river and were treated to the local seafood speciality of elephant earfish. 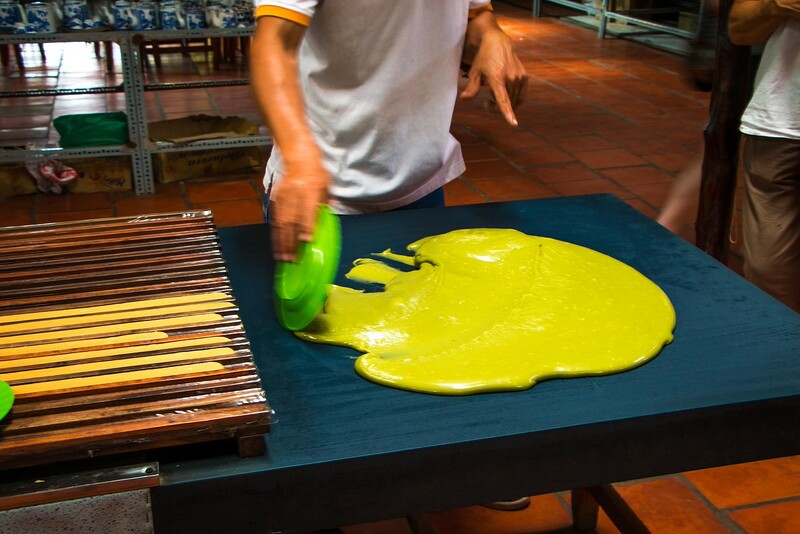 Deep-fried and mixed with rice noodles, lettuce, cucumber and pineapple stuffed into a rice paper wrap and dipped in a typically fresh Vietnamese sauce, it was absolutely delicious. Afterwards, we took a short but slightly hair-raising jeep-ride back to our boat with our local guide and fellow travellers. Even Barry’s hair was out of place for once – wow! 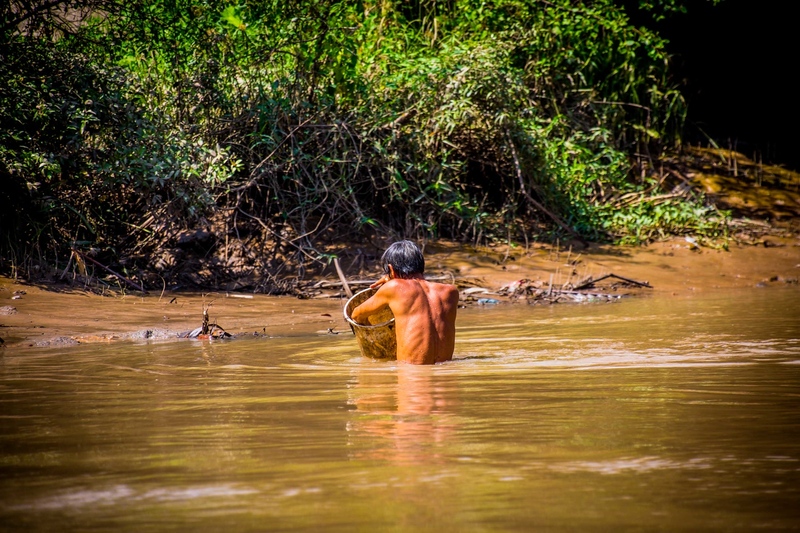 A day on the Mekong starts very early, usually before dawn for most locals. 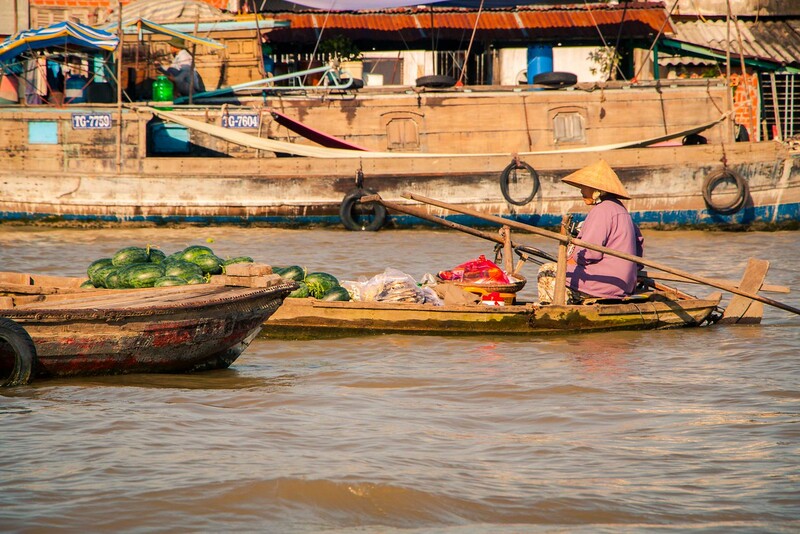 So we decided to do the same when we took our early morning boat trip from Ben Tre to Vinh Long. We’d become adapted to early rises – they’re hard to avoid when the sun beams into your room at 5am! So a 6am start was no problem, especially since it’s a great time to witness life on the river while the locals make the most of the coolest part of the day. 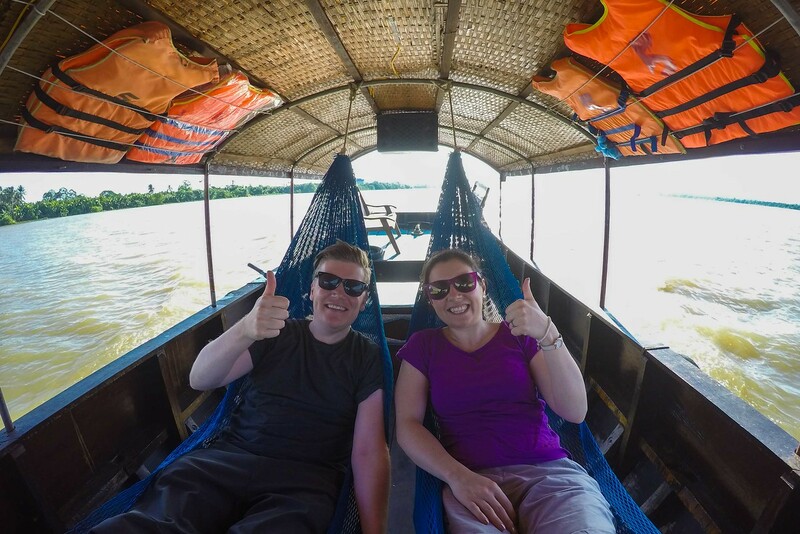 We loved all of the boat trips we ventured on during our week in the Mekong Delta, but this was one of our favourites…probably aided by the novelty of swinging on hammocks while we sailed! 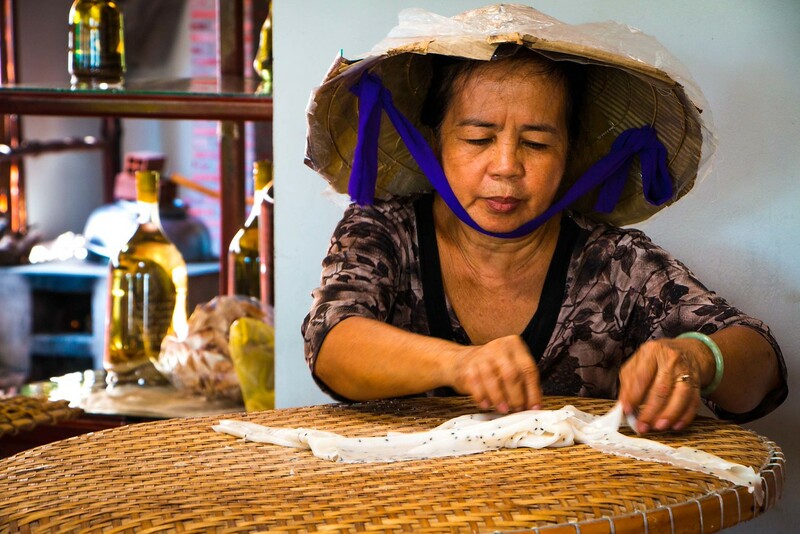 It’s these little surprises that make us love Vietnam! 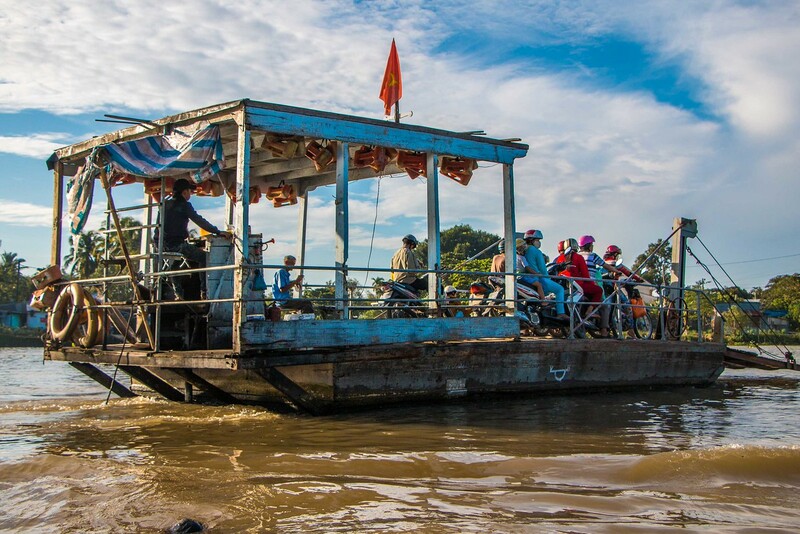 It’s not cheap, but it is possible to charter your own boat to take you between destinations in the Mekong. We decided to do this for one of our journeys around the area, not only to avoid a hot local bus trip (though this was a bonus! 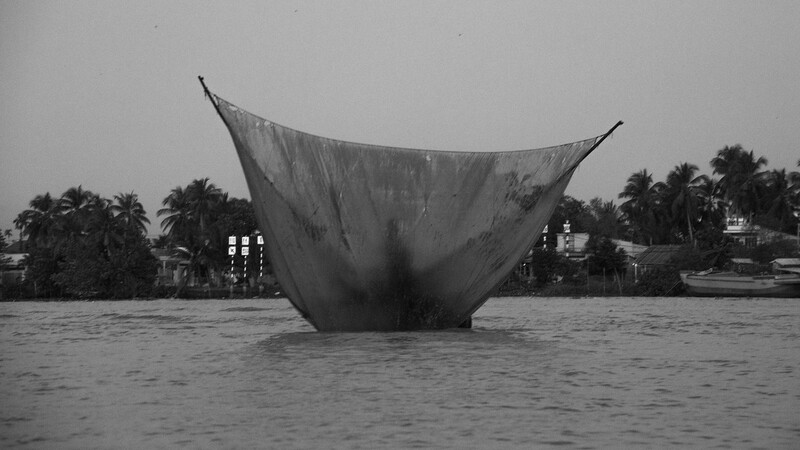 ), but to have the opportunity to see and experience more of the Mekong. After all, it’s all about the river and that’s where most of the interesting day to day life occurs! Instead of 2 or so hours in a hot and sweaty local bus, we spent 4 blissful hours chugging along the river in this lovely boat. 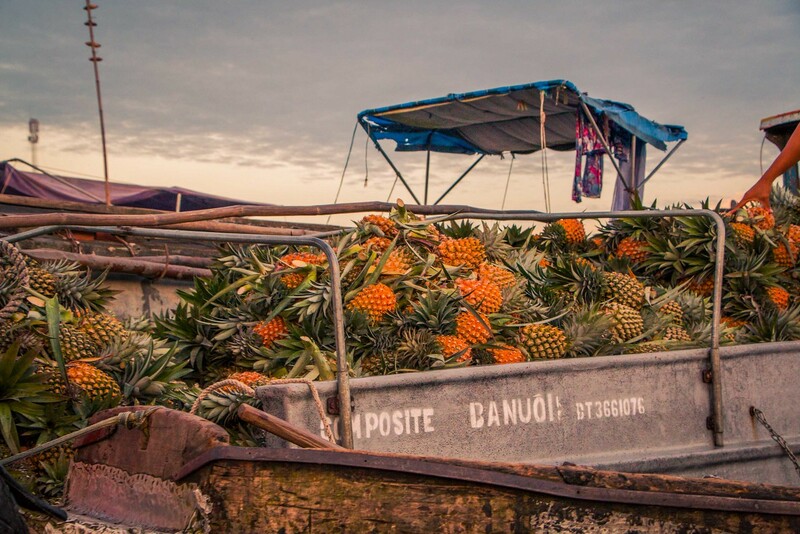 From fully loaded rice barges to fruit and vegetable farmers transporting their goods to market, we chugged by all kinds of boats and ships going about their business on the river (even a floating petrol station!). There was always something happening! With so much going on, it was fascinating just to sit back and observe river life all around us. Before we knew it we were almost 4 hours into our journey and getting closer to our next Mekong destination of Vinh Long. 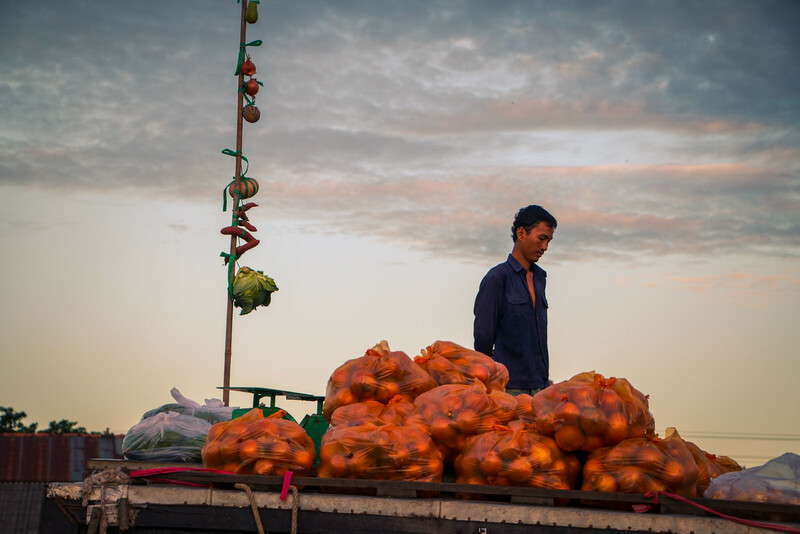 After some 4 hours or so of sailing along the river, stopping off at a couple of floating fruit-sellers along the way, our boat finally left the expansive Mekong river to make its way along the more narrow ‘sông Cổ Chiên’ river for the final leg of our journey towards Vinh Long. Unable to communicate much with our boat driver due to our lack of Vietnamese and his lack of English, we had had no idea how long it would take to get to our homestay accommodation. 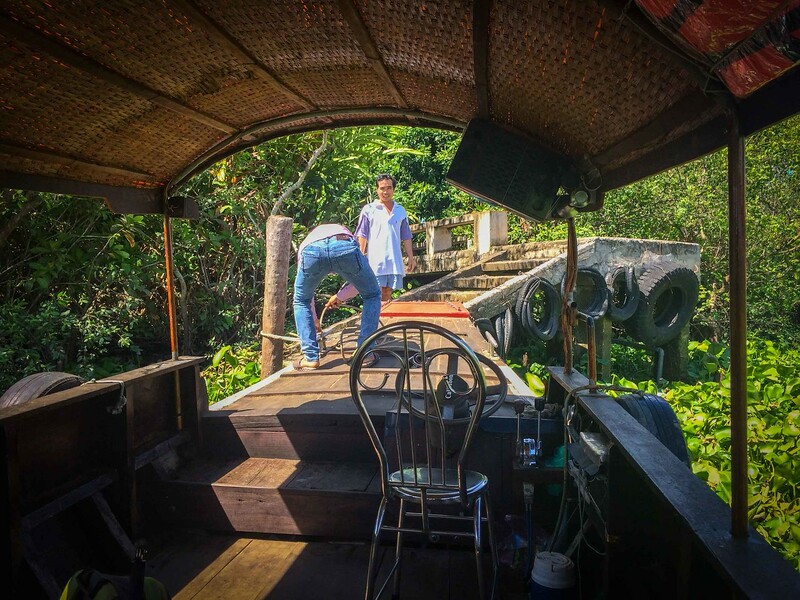 So it was a great surprise when after around 4 and a half hours of chugging, our driver finally slowed the boat and manoeuvred us towards a tiny overgrown jetty by the side of the river. For a moment we wondered if it was the wrong place due to the overgrown vegetation and lack of boats at the small jetty, but as we made our approach, we spotted a local man giving us a very enthusiastic double-handed wave in the distance. Standing beside his bicycle, his face broke into the warmest and most welcoming of smiles. We knew then this must be the right place, and this lovely looking gentleman must be our host! 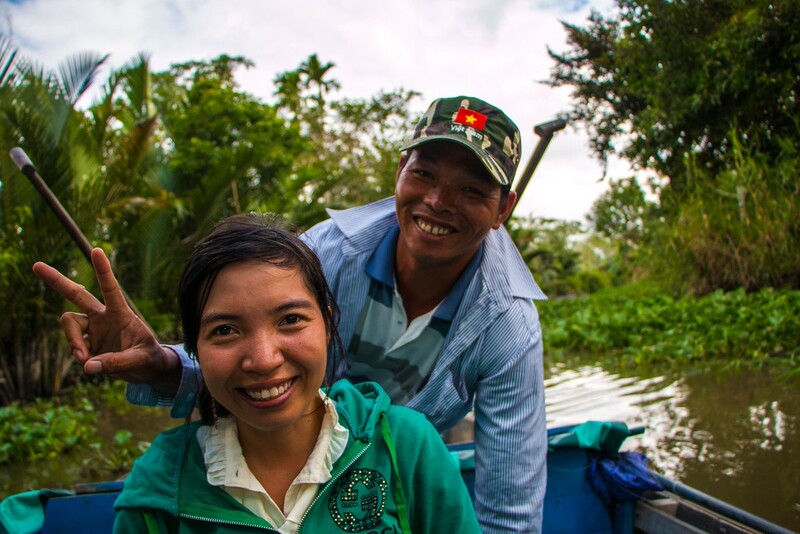 With our boat moored up, we thanked our driver and jumped onto the jetty where we were warmly greeted by Mr Truong. He was the owner of Ba Lình Homestay and kindly loaded our bags onto his bike before guiding us towards his house. It was only a short walk, but a fascinating one as we tried to take in our new surroundings whilst chatting along the way. 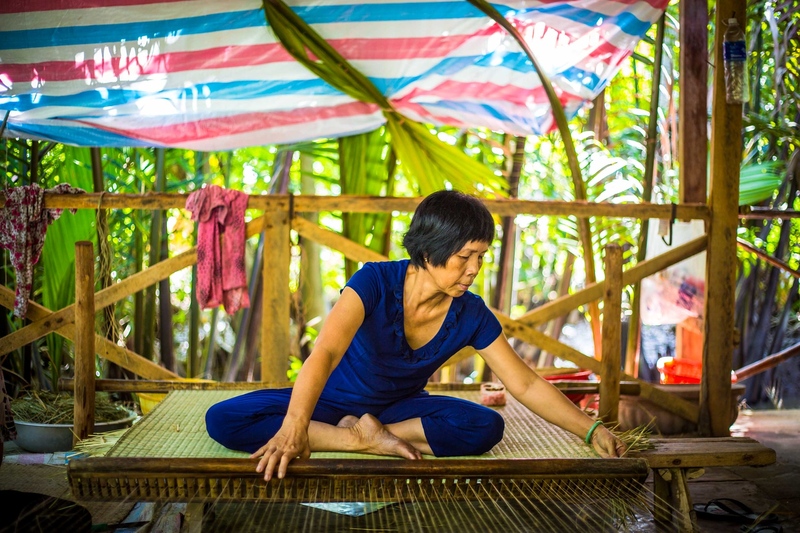 The route was initially along a lush forested path, shaded on both sides by a dense growth of coconut trees and healthy looking green papaya plants. After a few minutes as the path widened, we passed by a small local community hall where there was music blaring, apparently from a neighbour’s wedding celebration. Following that we passed what turned out to be our neighbour’s home, where children played in the garden and dogs ran around chasing after them, and finally arrived to the homestay. It was beautiful and much larger than we expected! 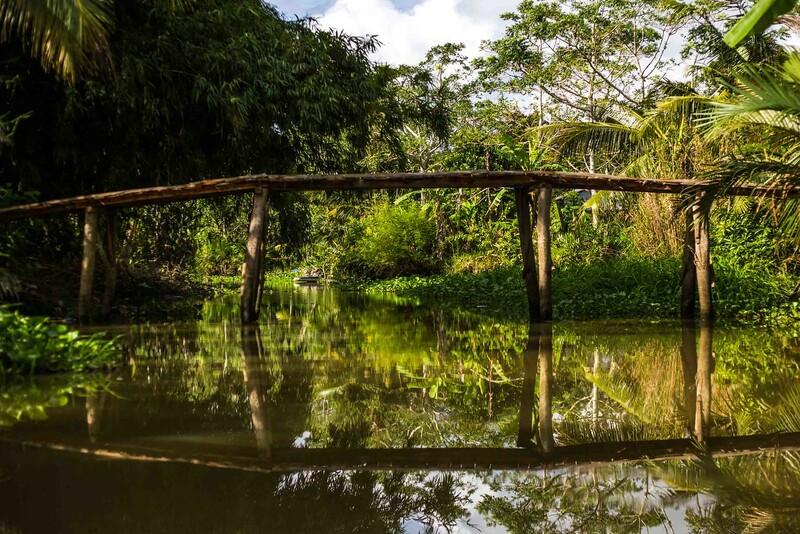 Two large wooden clad buildings, surrounded by beautifully lush garden teaming with fruit trees and fish ponds. It was simple and peaceful, and we immediately felt an air of calm about the place. Other than the occasional motorcyclist riding passed, there were no cars and the neighbour’s chickens were the only source of ‘noise’. We immediately fell in love with the place and were delighted it was our new home for the next couple of days. 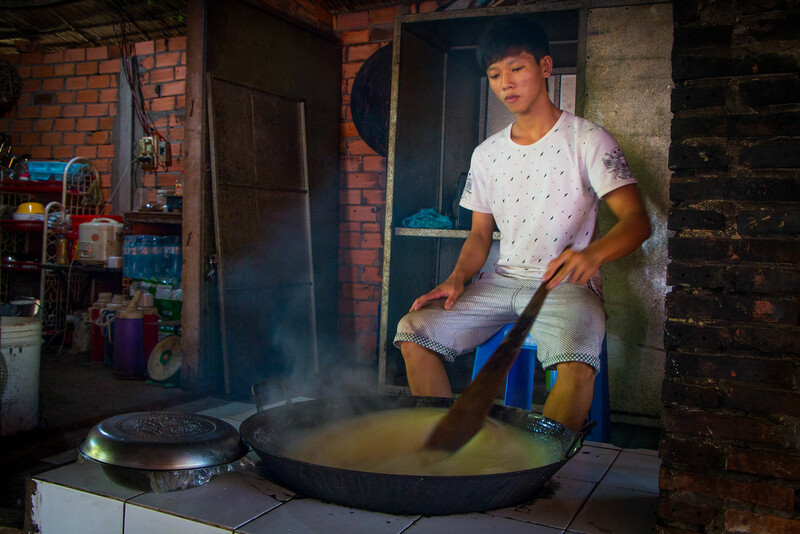 After being shown to our basic but pleasant room and a short tour of the house, we were welcomed with a pot of hot jasmine green tea, which we shared with Mr Truong as he spent time answering our questions and explaining his successful homestay business. As with our previous homestay experiences in Sapa and Ba be national park, it was more like a basic guesthouse with a host family. We like this because it means you’re not always in the main family home which gives you the choice to interact with your hosts and other guests as little or as much as you like, whilst still having some personal space in between times. 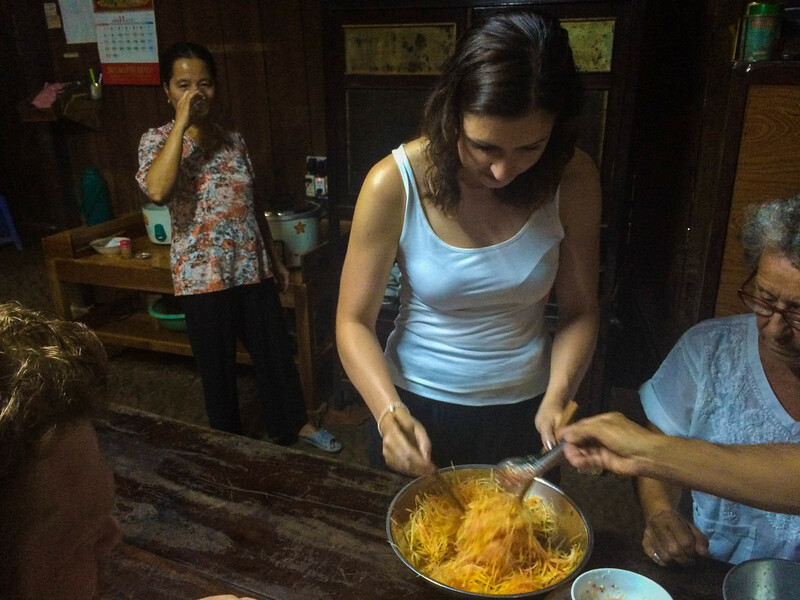 One of our favourite things about homestays, is not only getting to know the family and local customs, but also learning about the local cuisine and of course, getting to sample it! 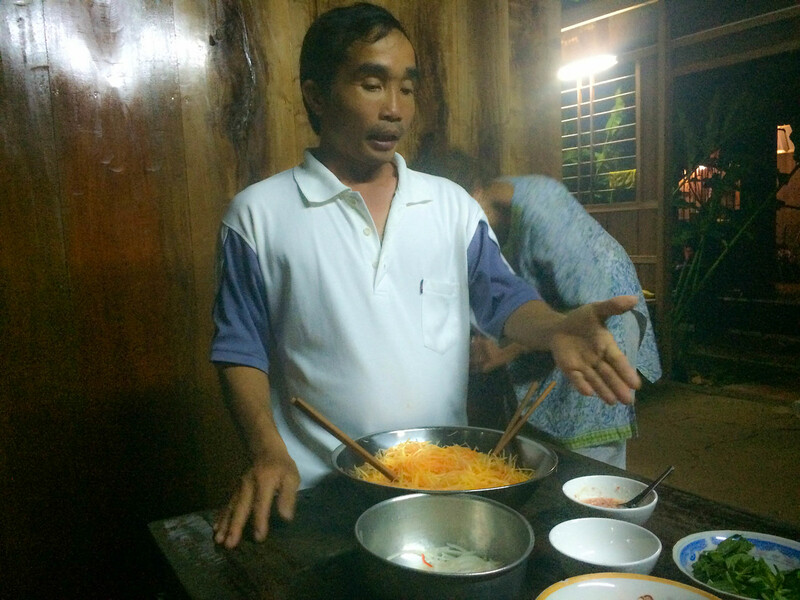 What we loved about Mr Truong’s homestay was that each night he welcomed all of his guests into his kitchen to help prepare the evening meal and learn a few local recipes. 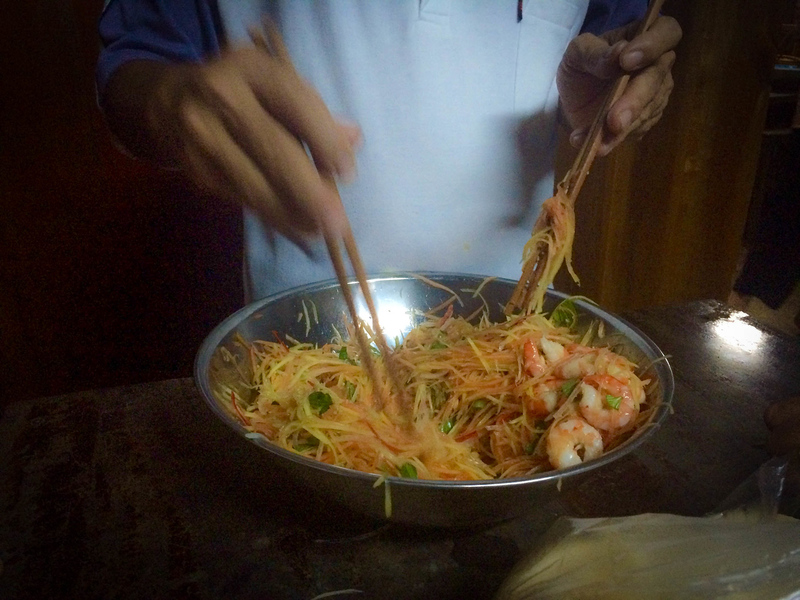 I was particularly happy when we got to make one of my favourite dishes, the famous Vietnamese Green Papaya salad with shrimp. 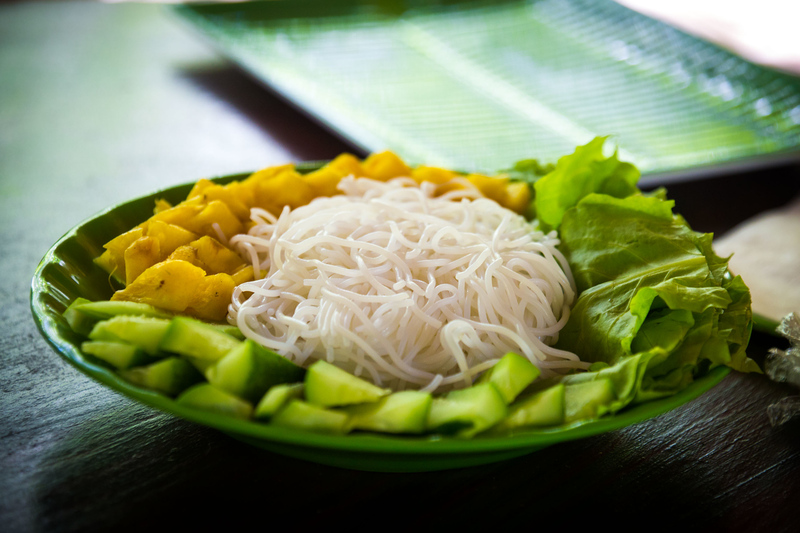 It’s a simple but extremely delicious salad, which we usually ordered with most meals when we got the chance! 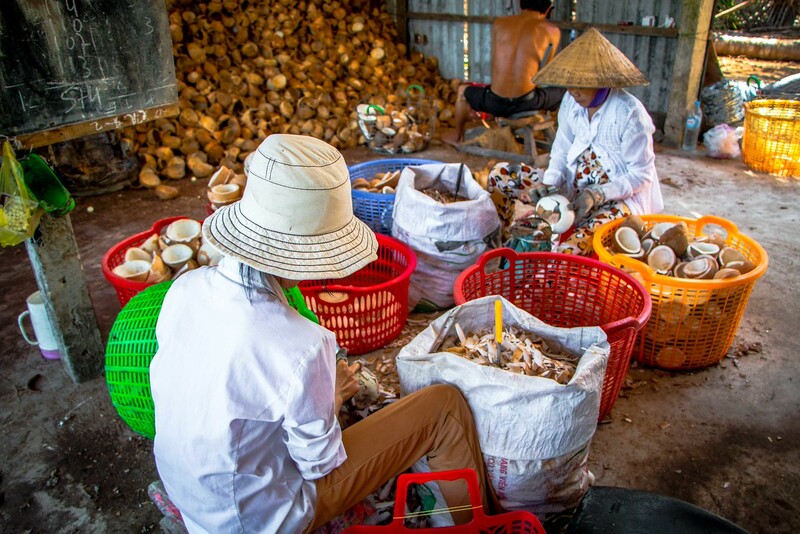 During our stay, we took a wonderful half day boat tour around the area which gave us the opportunity to explore Vinh Long’s small floating market and some local factories including a coconut, rice and honey making factory. Barry onboard the local fruit shop! 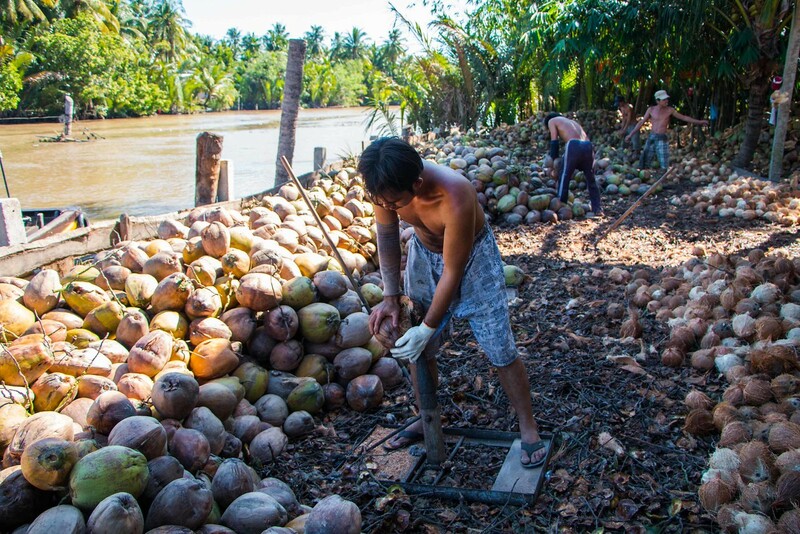 Like a lot of the Mekong Delta, coconut production is a main source of income in Vinh Long, with many factories perched by the riverside. 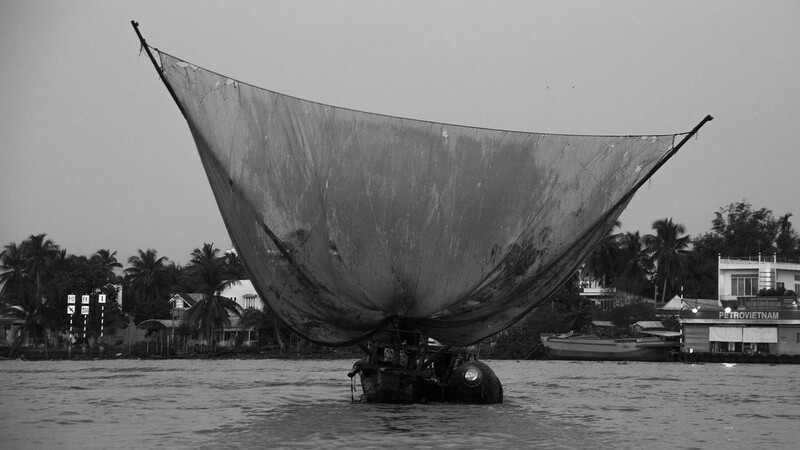 We visited this large one during our tour and found it to be another fascinating insight into local life. 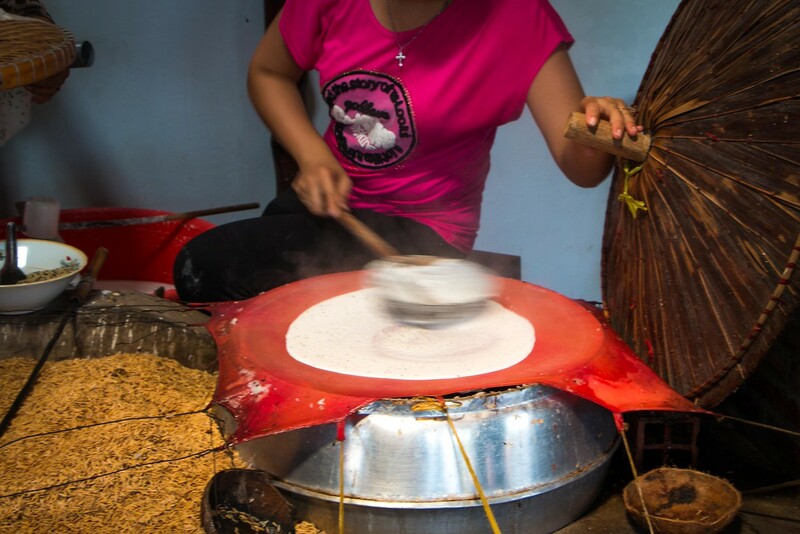 First we watched and learned how these coconut pancakes are all individually made by hand. 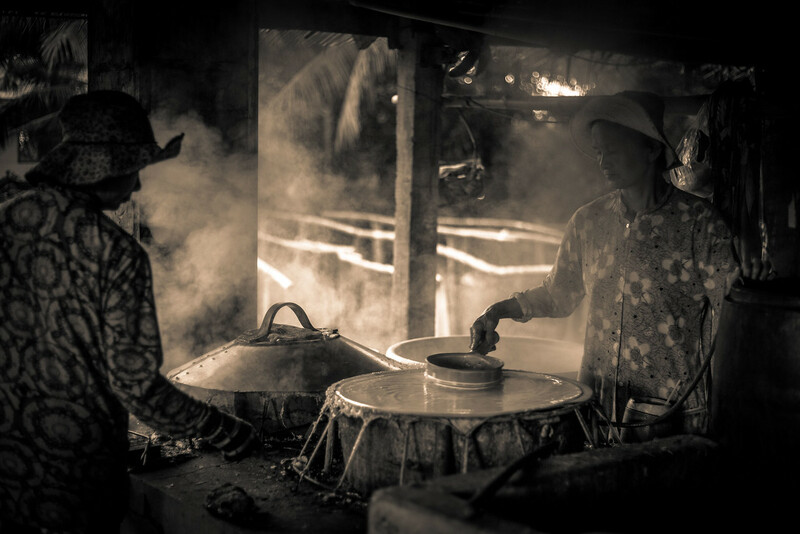 Then it was onto the coconut candy process, where each mixture is stirred by hand then cut individually after being set in a mould. It was a time intensive process, but with delicious results! 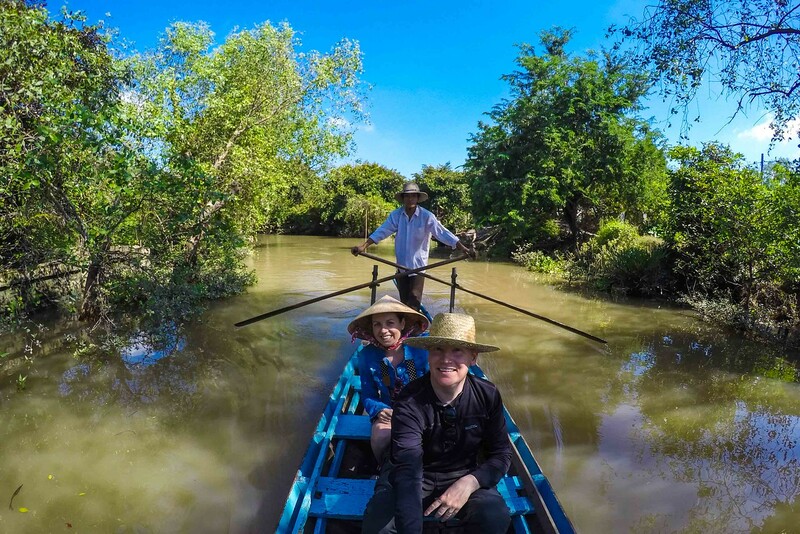 After our fascinating factory tours, we transferred onto a small rustic rowing boat to cruise through the quiet and narrow waterways around Vinh Long. Away from the hustle and bustle of the main river, it was a very peaceful way to fully appreciate the area’s stunning natural beauty. 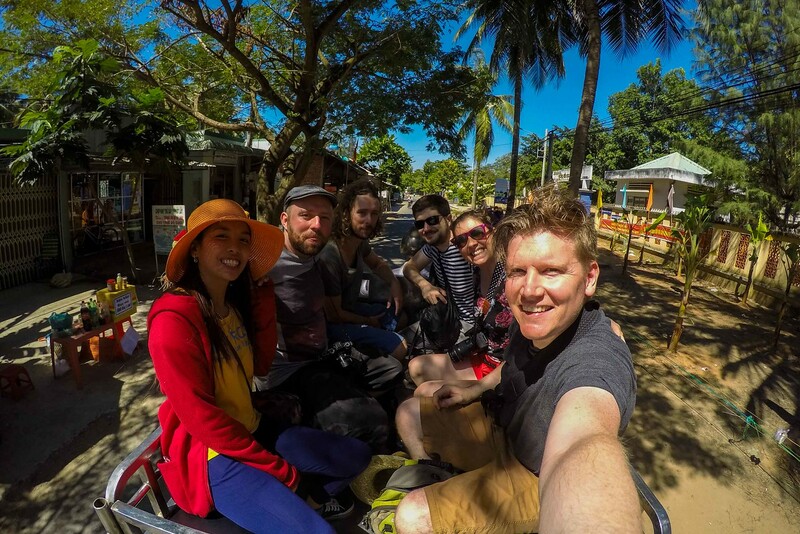 On our final day at the homestay in Vinh Long, along with some fellow travellers we’d become friends with at the homestay, we decided to explore the mainland area around, this time by bike. Despite the area being much more vast than we expected and having only a very basic map as our guide, we managed not to get (too) lost! Along the way, we came across large farmlands and settlements occupied by friendly local families who waved as we cycled passed or sometimes ushered us in to take a closer look. They were as intrigued about our being there as we were about them! 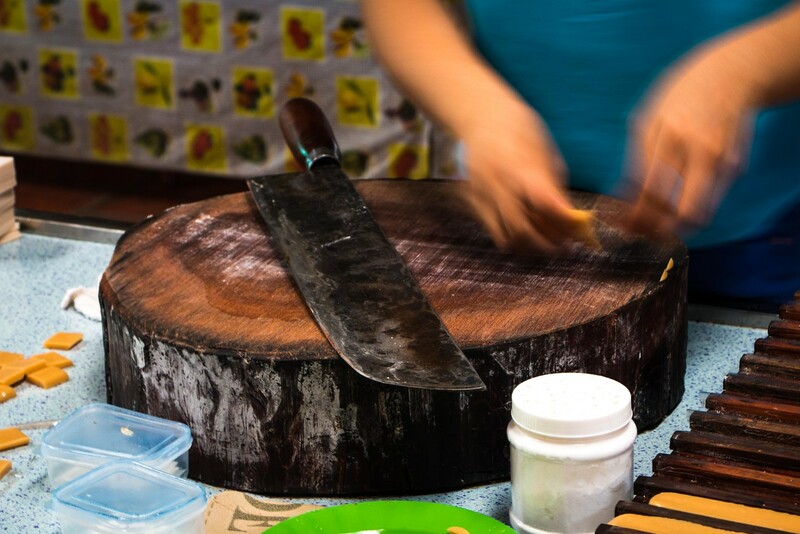 That evening we spent more time learning to cook local Vietnamese dishes with the family, as well as getting to know our fellow guests from all parts of the world. 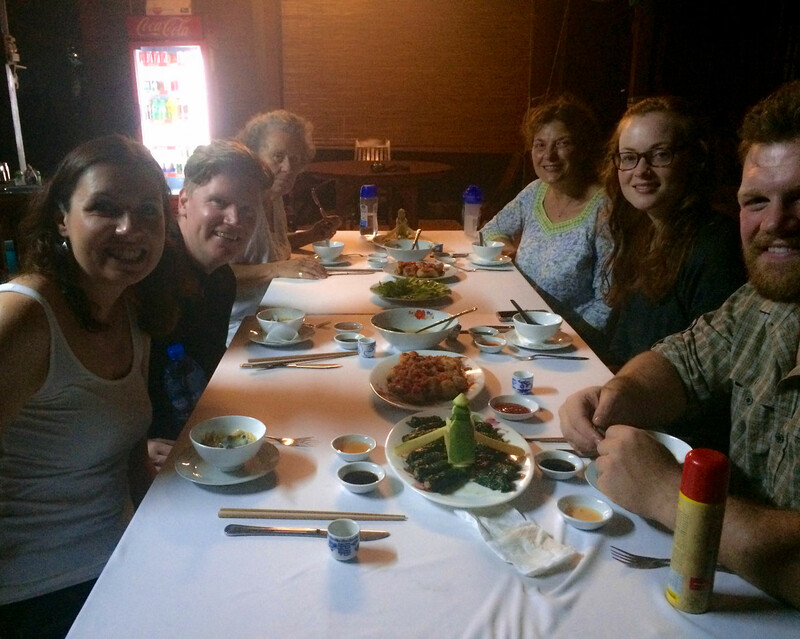 It was another wonderful Vietnamese homestay experience. 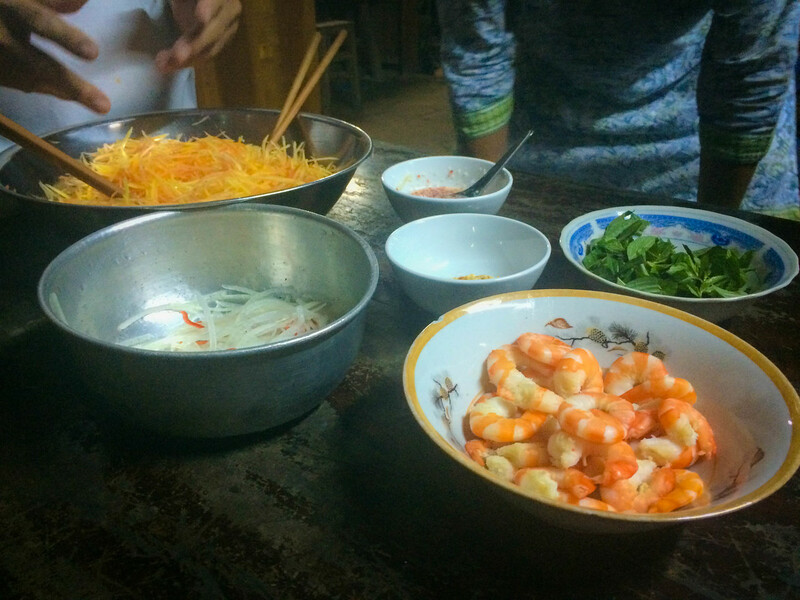 We’d learned about the local family culture, tried various local foods (we might not have otherwise tried on our own), made some great friends in our fellow guests, and got the opportunity to have local experiences we wouldn’t have otherwise had. 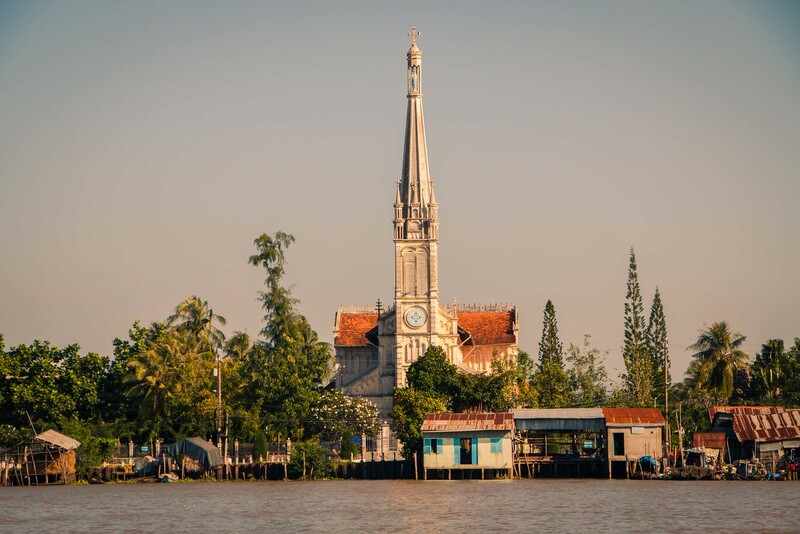 Our third and final destination on our ‘DIY’ tour through the Mekong Delta was to the bustling riverside city of Can Tho. 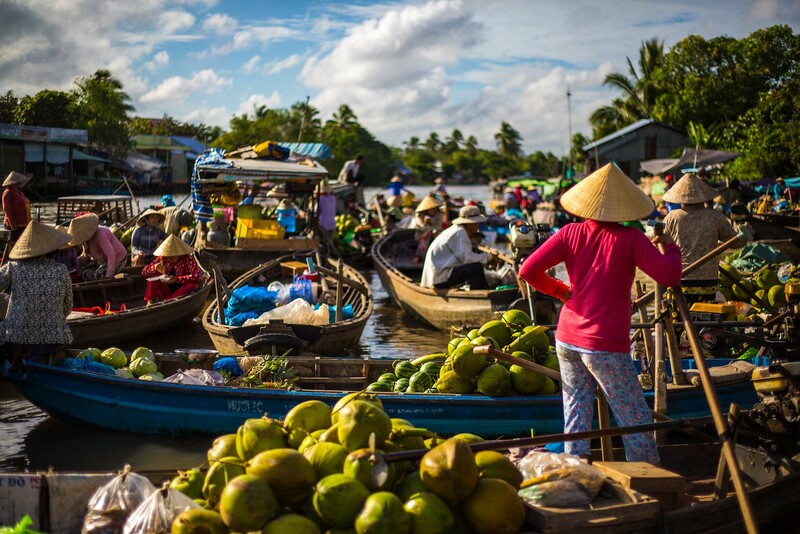 Famous for its floating markets and university, there is a constant bustle of activity in Can Tho both in the streets and on the river! 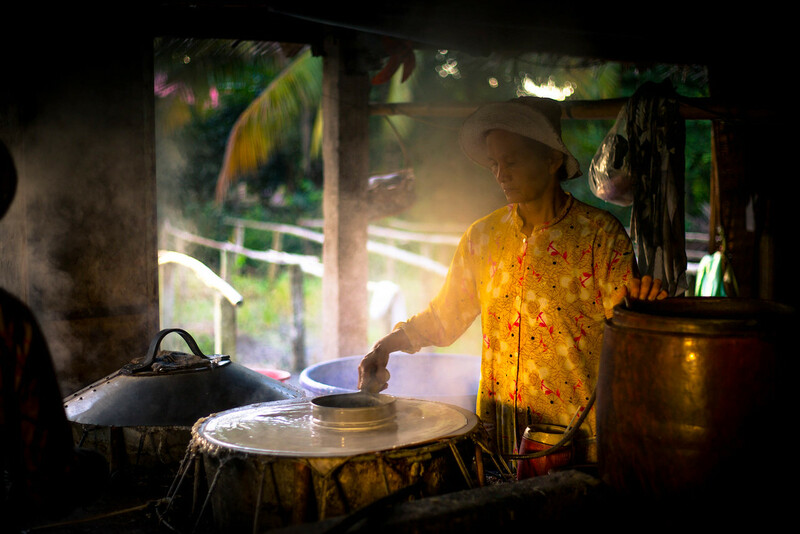 From locals making their way to stock up on supplies from the early morning markets, to late night gatherings around small plastic tables on the kerbside where families and friends tuck into shared steaming hotpots and barbecued pork skewers, the buzz of life seems endless here. 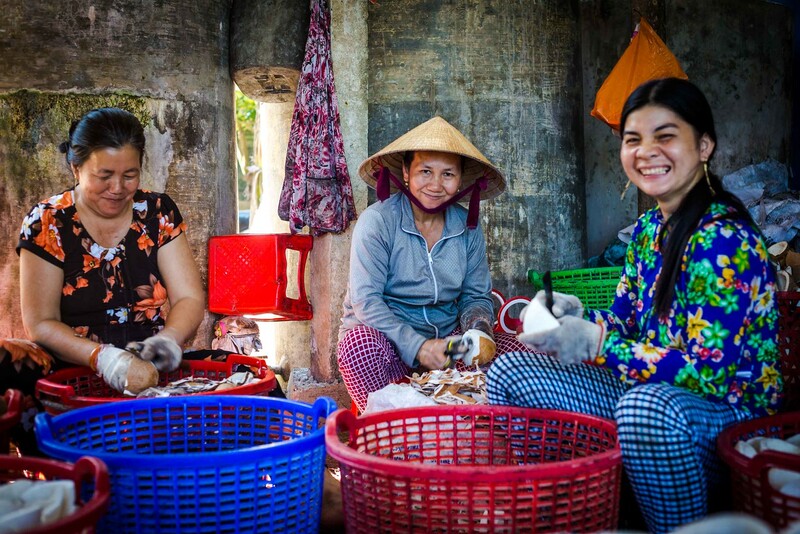 Though that’s Vietnam for you and what we love about it! 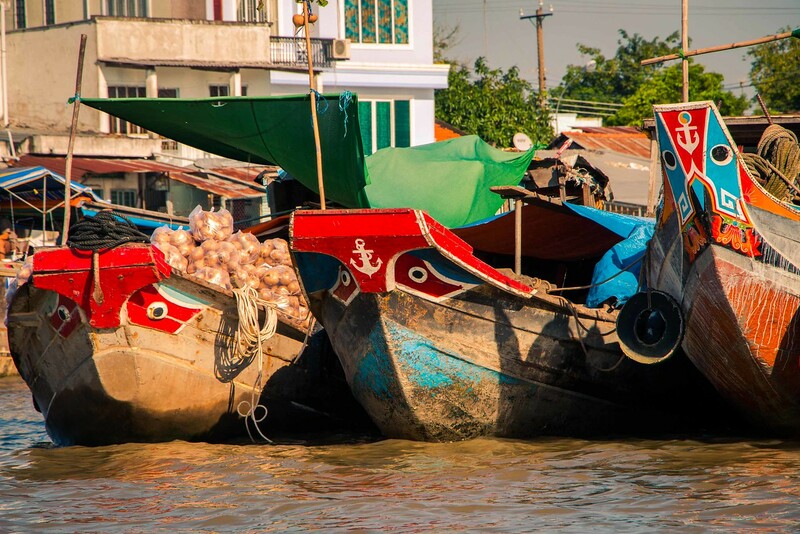 One of the most popular draws of Can Tho is its large wholesale floating market. 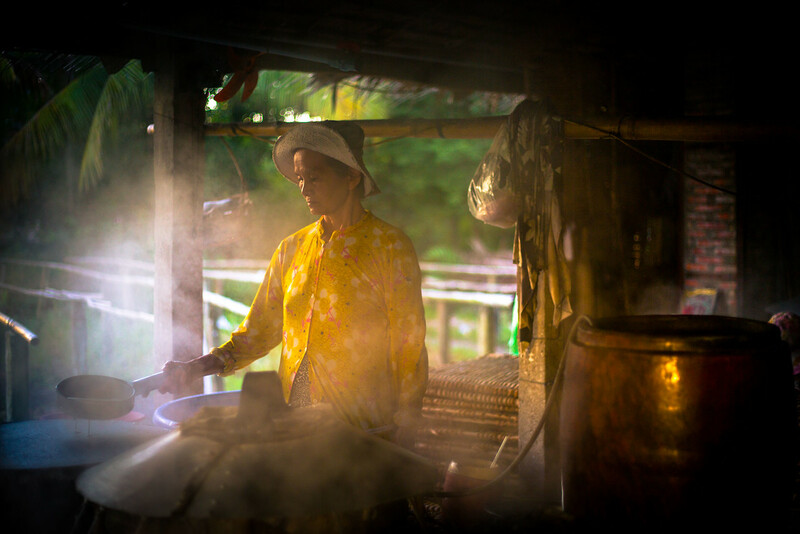 Known as ‘Cai Rang’, it begins very early in the morning (typically immediately after sunrise around 5am) and lasts for the full morning until the day heats up around noon. To avoid the crowds and larger tour boats, it’s best to get there as early as possible. So thankfully already adapted to the early rises of the Mekong, we signed up for a sunrise tour and we weren’t disappointed! It was peaceful yet fascinating to be on the river at such an early hour. 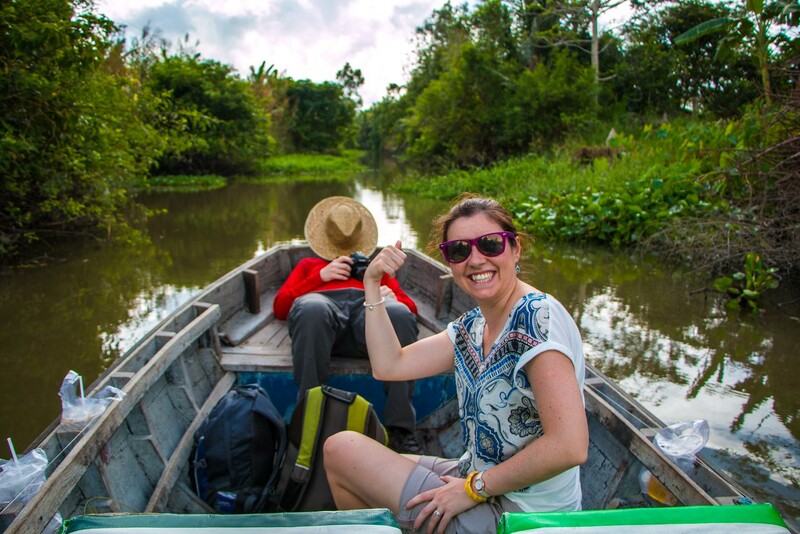 With coffee in one hand and our cameras in the other, our boat slowly chugged its way along the river while our local guide explained about local river life. As usual the river was awash with early morning activity, and we loved witnessing this ancient fishing technique being used by local fishermen. 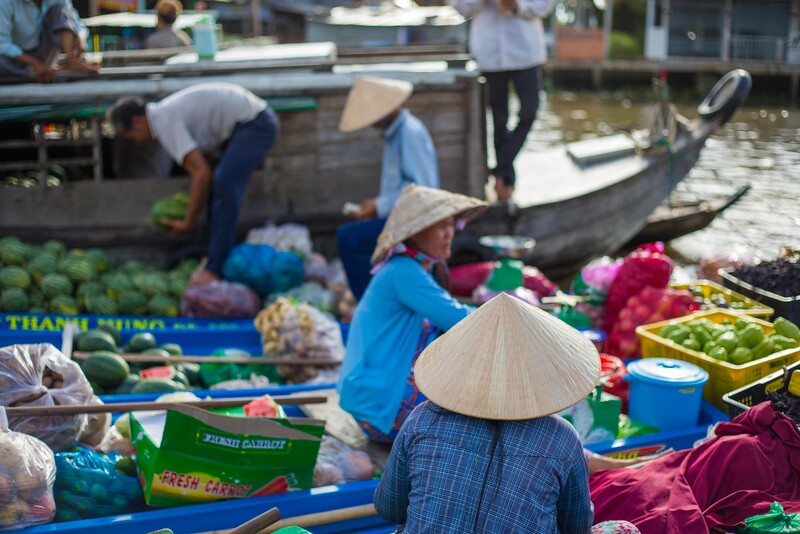 It was an hour or so before we finally arrived to Cai Rang floating market, and we were excited and intrigued to see how it all worked. In the distance, we could already see lots of boats in position, waiting for customers to load up on their fresh goods. As we got closer we could see the fully loaded boats, almost brimming with fresh produce! 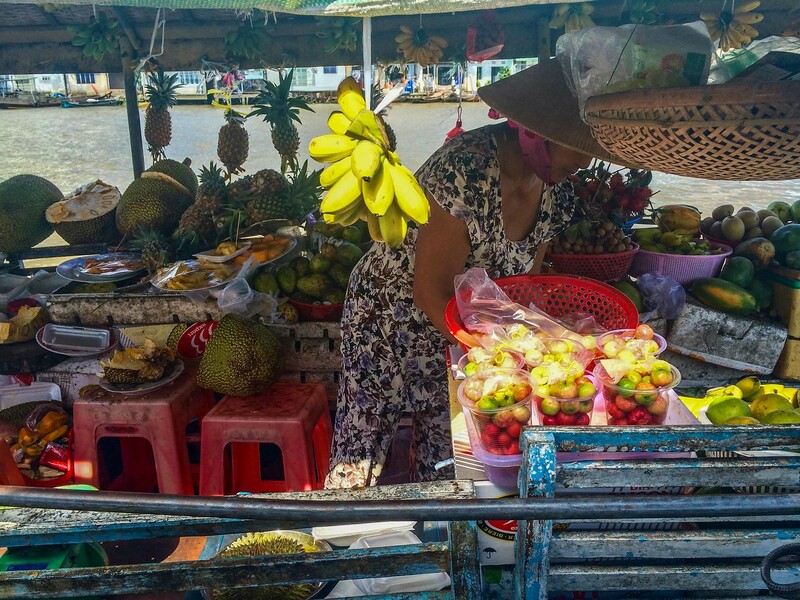 From potatoes, carrots and pumpkins to watermelon, coconuts, pineapples, and papayas, there’s a huge variety of fresh produce on offer, most of which comes from local farmland. What was fascinating was the technique used by all of the sellers for advertising their goods. We noticed it straight away. 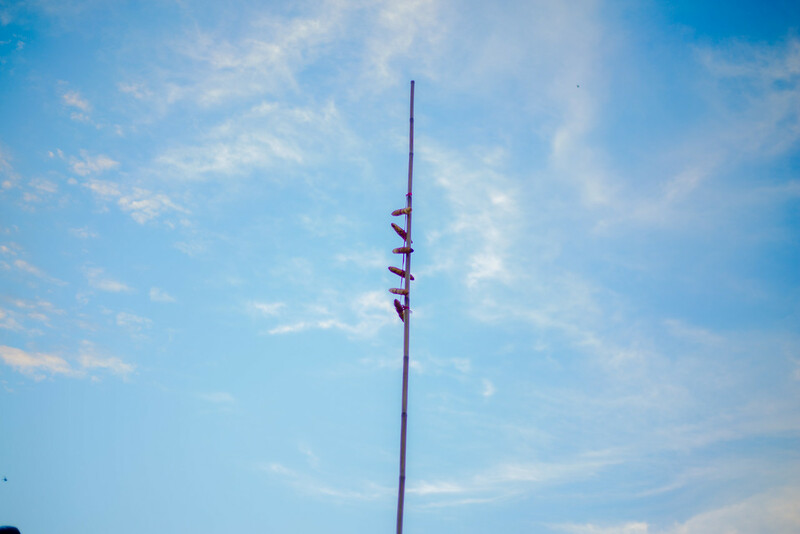 Can you see the long poles sticking out of the boats in the photos above? 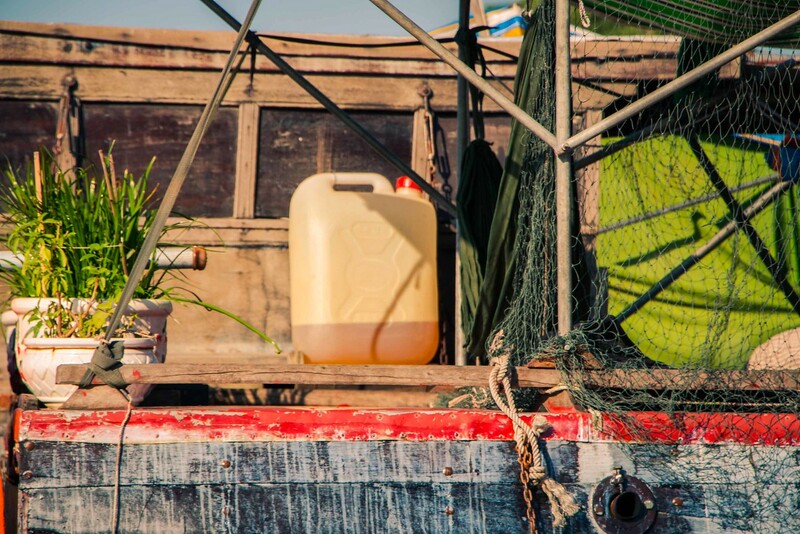 These are bamboo sticks, adorned with a selection of the boat’s goods, designed to make it easier for buyers to find what they’re looking for. Want some carrots? Just look up and scan the horizon! 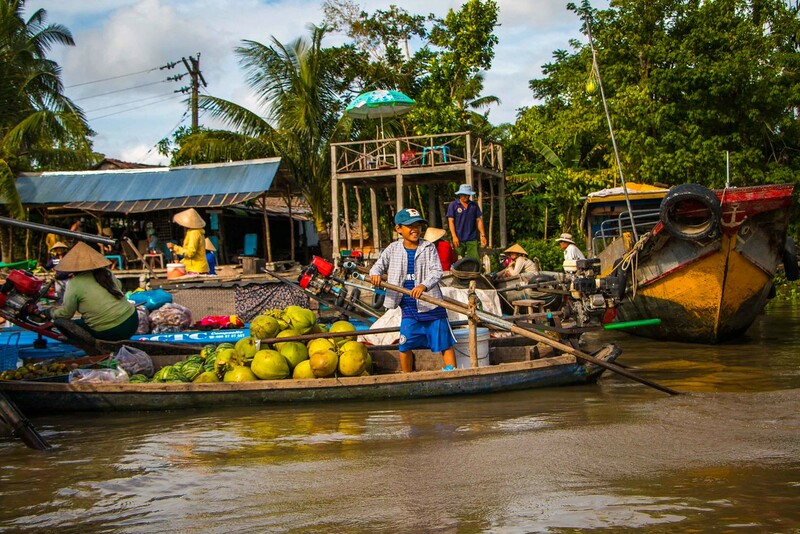 Cai Rang is one of the largest floating markets in the Mekong Delta and well worth a visit. 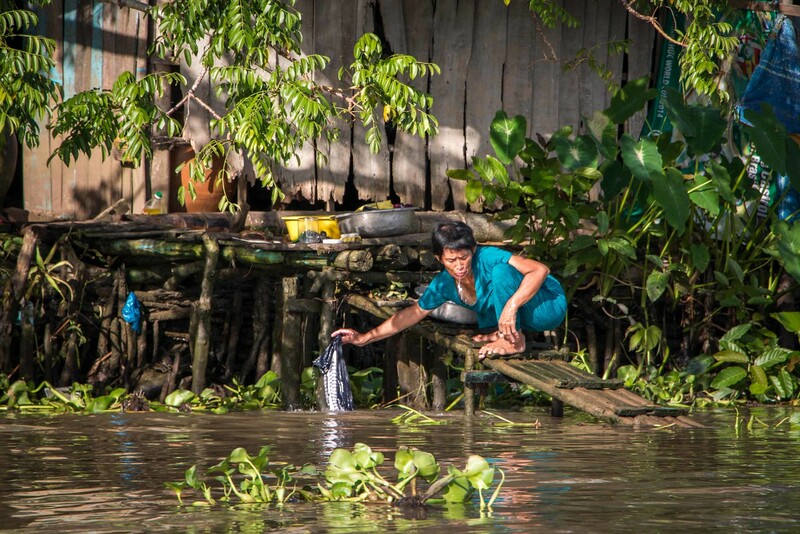 Many villagers come to sell their produce and it’s fascinating to observe everything happening on and around the river. It’s a unique way of life to us but just normal daily business for the locals, most of which even took the time to wave hello or give us a warm smile as we chugged by with intrigued eyes. Following our visit to the floating market, we continued further along the river until turning off along one of the many narrow canals. From here we chugged along until we reached our jumping off point for this coconut and rice noodle factory. It was another fascinating insight into local business. 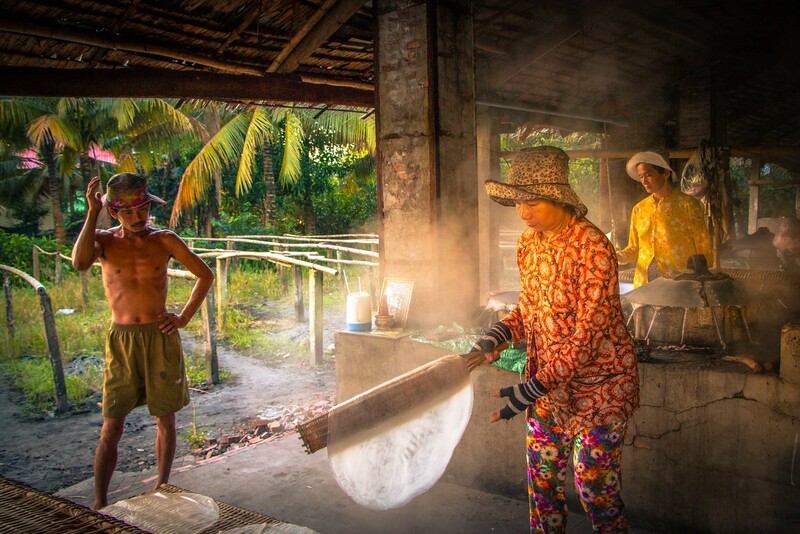 We learned the techniques of coconut pancake making and noodle manufacturing, all within a rather atmospheric family-run factory. Lastly, our tour brought us to this quaint and quiet waterway. It was just one of the many picturesque rural canals in the area where it’s fascinating to observe riverside village life. It was great to step off the boat for a change and have a wander around the village. 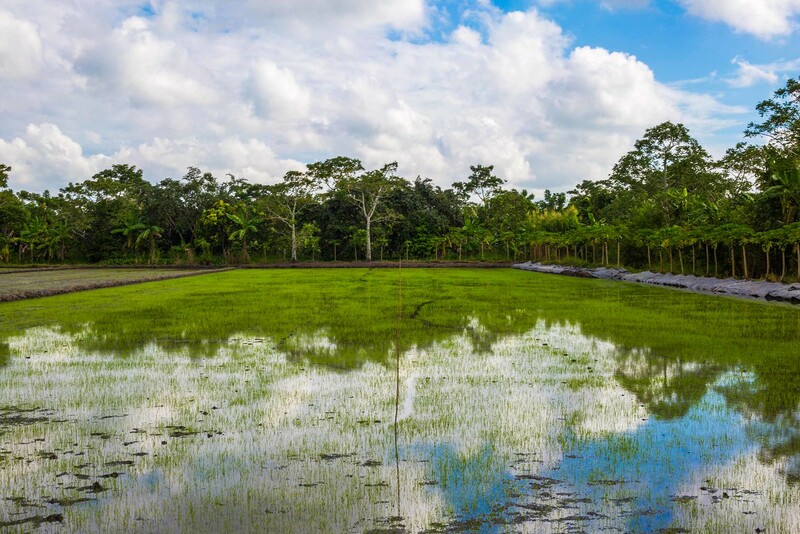 It was beautiful, thanks to its lush rice paddies, fresh growing fruit (everywhere!) and scenic narrow bridges connecting small canals. It was fun attempting to cross the ‘monkey bridges’ along the way, as their named by the locals due to the narrowness of the pieces of wood. Perfect for monkeys but not so much for us! We also came across the largest jackfruit we’d ever seen growing on trees along the way, oh and of course more fresh coconuts. 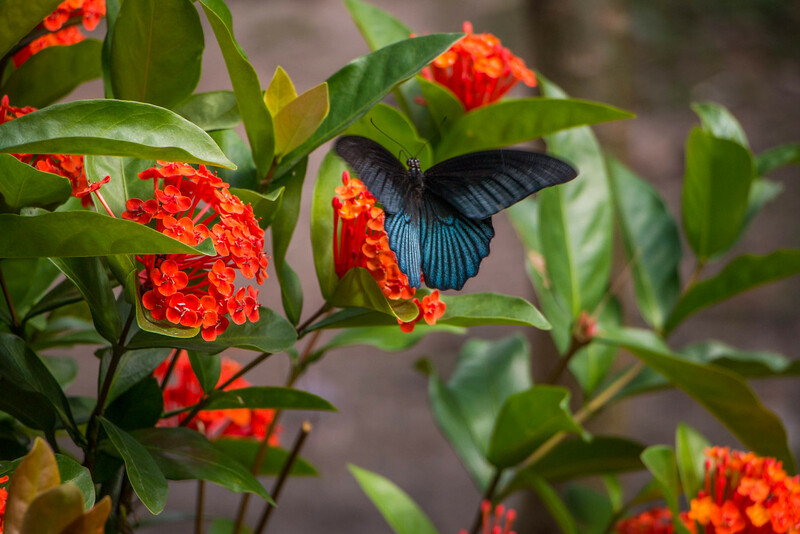 It’s no wonder there’s lots of butterflies around. 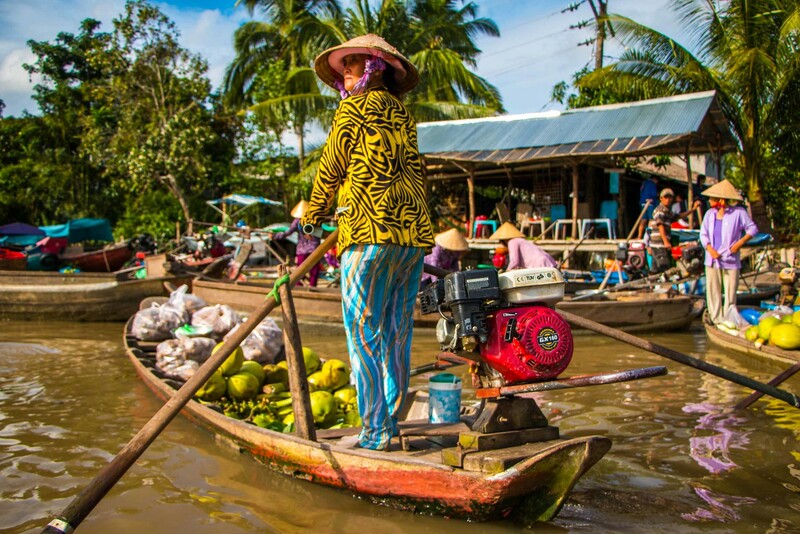 The Mekong Delta is a vast and incredible place to visit, and in our opinion the best way to see it is to organise your own DIY tour. 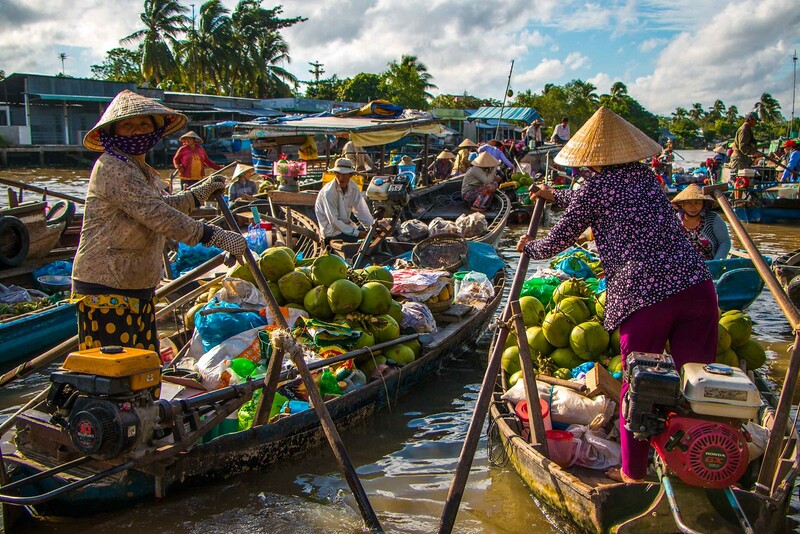 There are many options from Ho Chi Minh City for day and overnight tours, but to get a better sense of the Mekong Delta, you need to take it slowly! 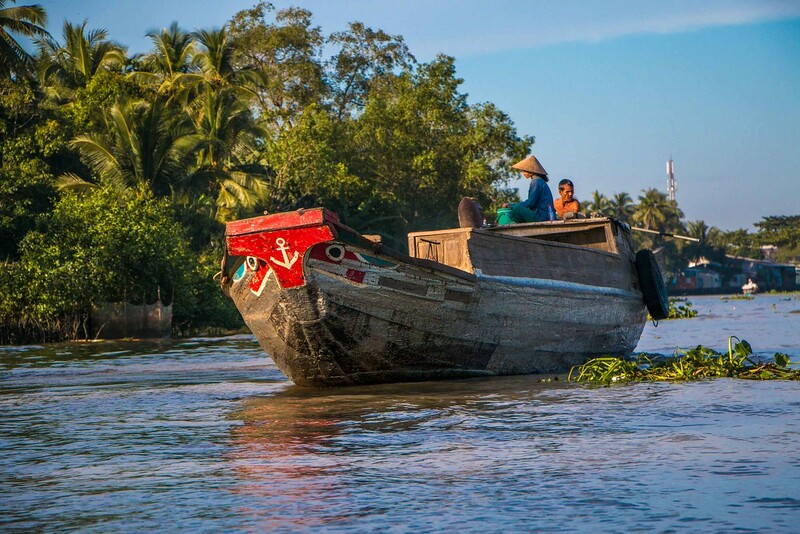 Jump on that bus, hop onto that boat and get out and see a different side of Vietnam! We’d recommend Thinh Phat bus company for this easy 2 and half hour journey from Ho Chi Minh City. They have regular buses (leaving every half an hour when we travelled with them) from ’25a Su Van Hanh Street P9 Q5 HCMC’ (not far from district one) and tickets are very reasonably priced (only a few pounds each when we travelled). 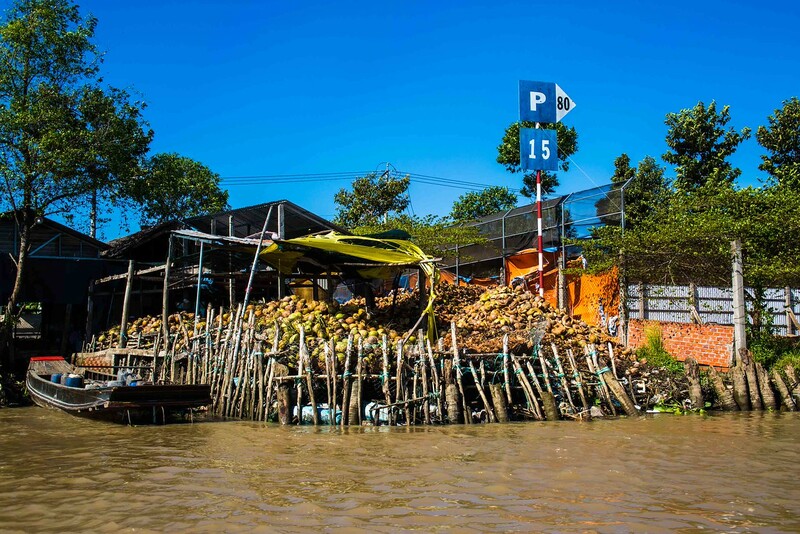 On arrival to Ben Tre, we were seamlessly transferred to a shuttle bus to make the final journey to our hotel, which was included in the bargain price. Instead of taking the public bus (which apparently takes around 2 hours), we opted to arrange a private boat transfer direct from our place in Ben Tre to our homestay in Vinh Long. 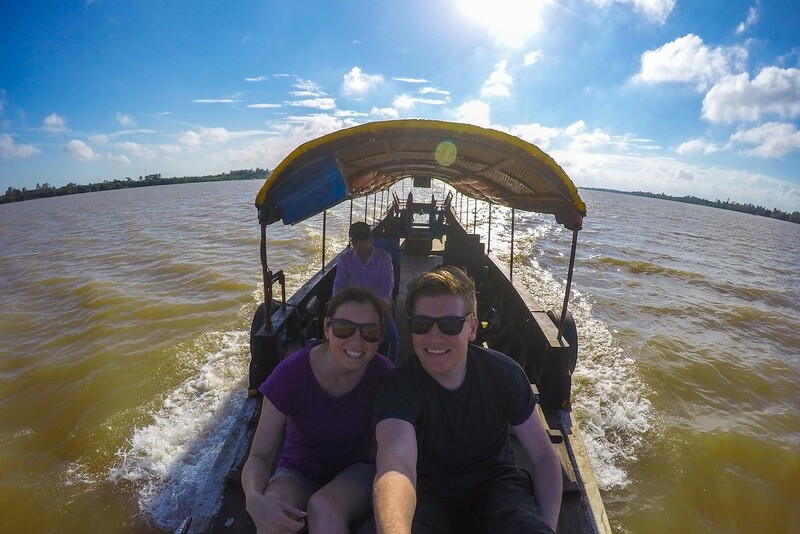 Although this was a much more expensive option ($50 each), it turned out to be one of the highlights of our Mekong Delta trip and therefore was well worth the extra coin! Especially as we had a private boat with our own skipper, comfortable seats and our own hammocks to chill out on, it was worth every penny and we loved it! 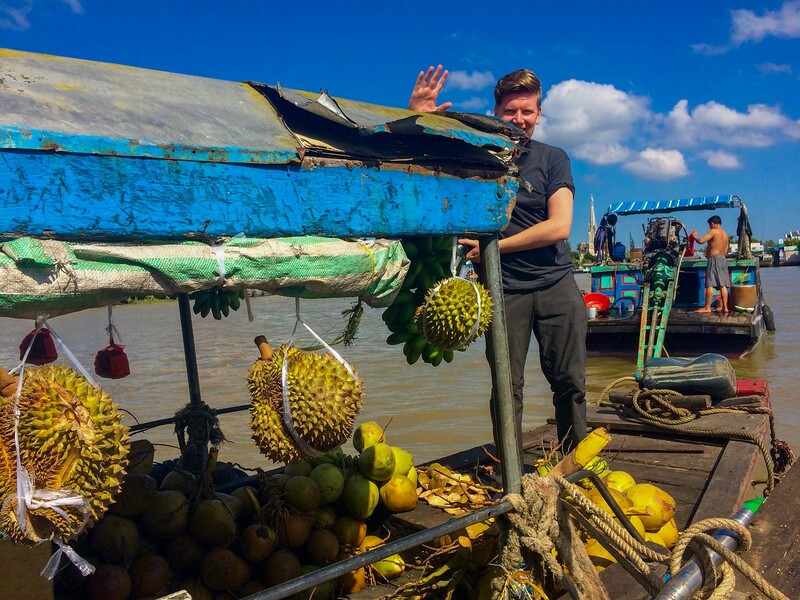 We were on the boat for around 4-5 hours and also stopped off at a floating market along the way too, so it was also like a tour rather than just getting from A to B. So if you can afford this we’d highly recommend it, however there is also a public bus option to Vinh Long if you’d rather save on this. 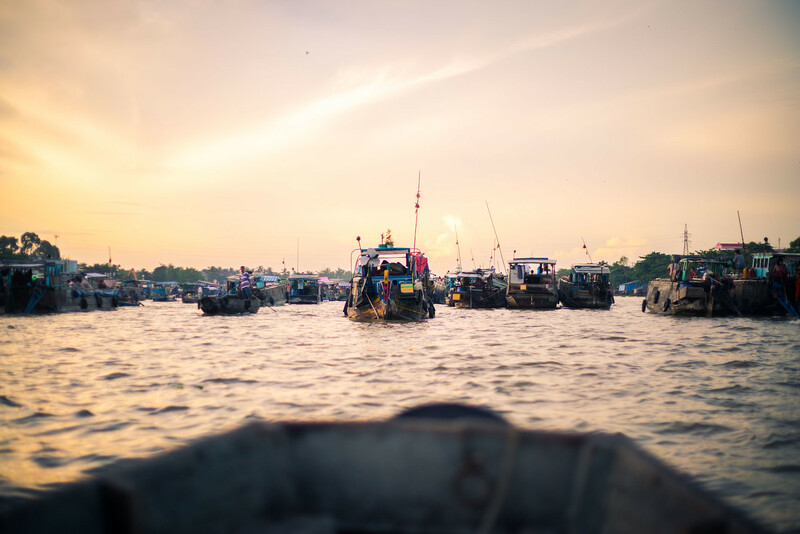 From our homestay in Vinh Long, we followed our host’s guidance to catch the local ferry back to the main town where we very easily picked up one of the many public buses traveling to Can Tho city. They are both regular and cheap (we paid only 40,000 dong each, around $2!) for the roughly hour and a half journey. Obviously there was no A/C for this price and it’s a very local bus (I.e. It stops very often on the way to pick up absolutely anyone who waves their hand out on the road!) 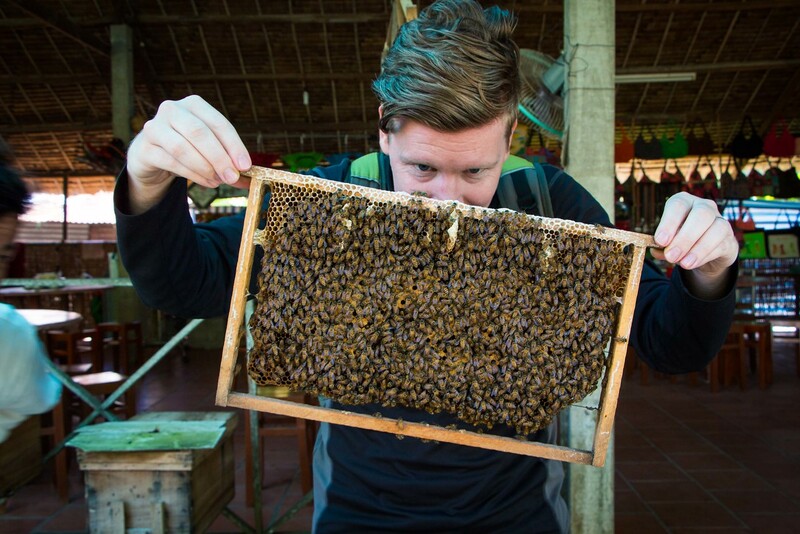 however it’s an amazing experience and one to have at least once on your travels in Vietnam! 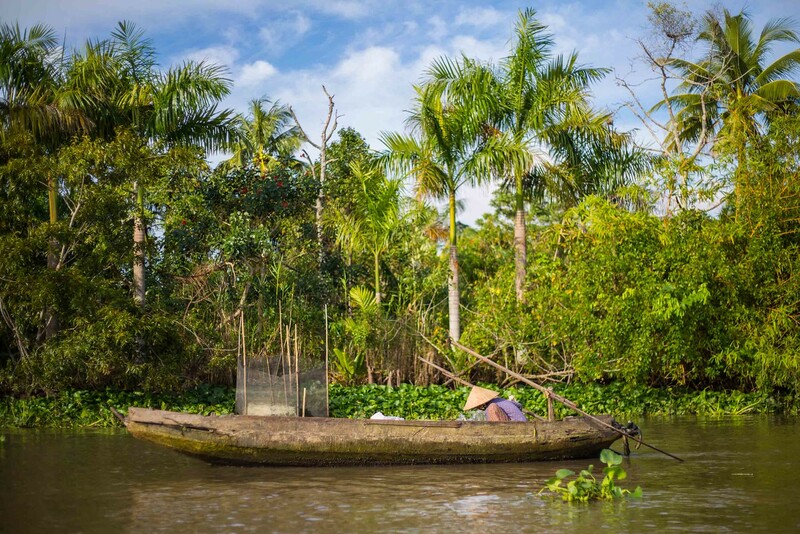 Have you visited the Mekong Delta? Let us know where you’ve been in the comments below! Or interested in discovering other amazing boat tour experiences? Check out our top tips on the amazing paradise that is El Nido in the Philippines. Full info on El Nido Tours here! 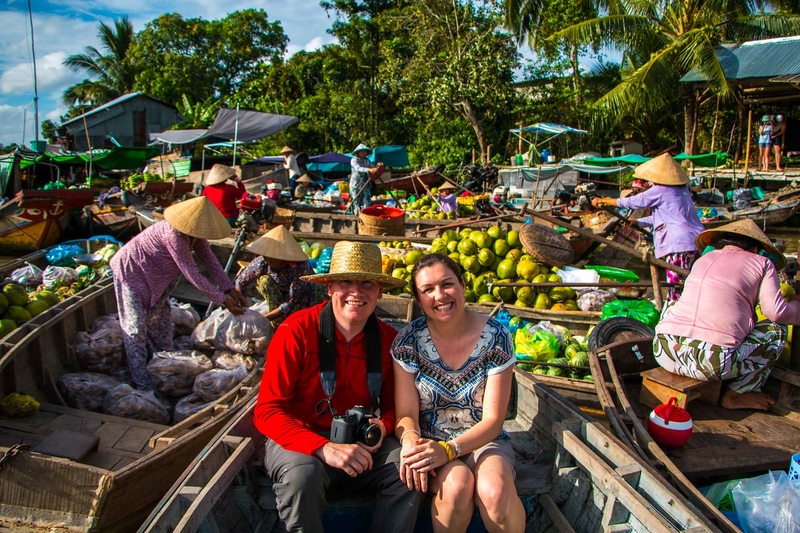 Thank you very much for this very lovely and informative article on your DIY Mekong Delta Tour! It was really inspiring! I love the idea of exploring the delta on your own to get a feeling of what life is really like over there. 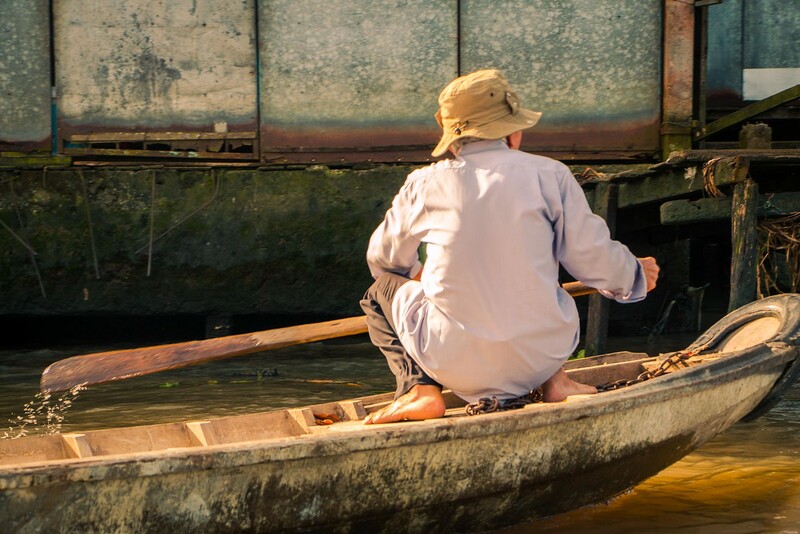 I had a few questions if it was not too much trouble: where and from whom did you get your half day boat tour in Ben Tre?and also how did you arrange the private boat transfer from Ben Tre to Vinh Long? Taking a boat between these two cities is indeed a very clever idea and certainly more agreeable than a bus ride! Thank your again for inspiring us in our travel. Beatifull report ! Tanks – Merci pour cette page authentique. I see here many informations that tourists never seen. 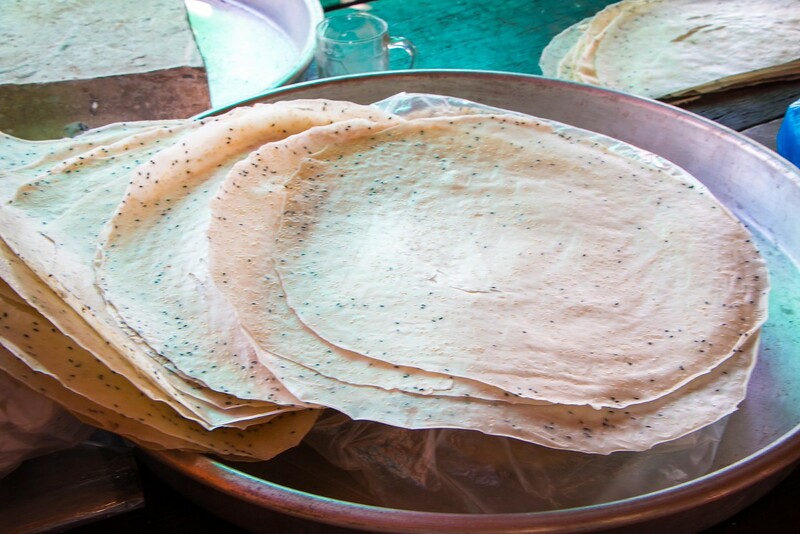 There is soo many local fond specialities : I home they will keep them. Those are important immaterial “patrimoine”. 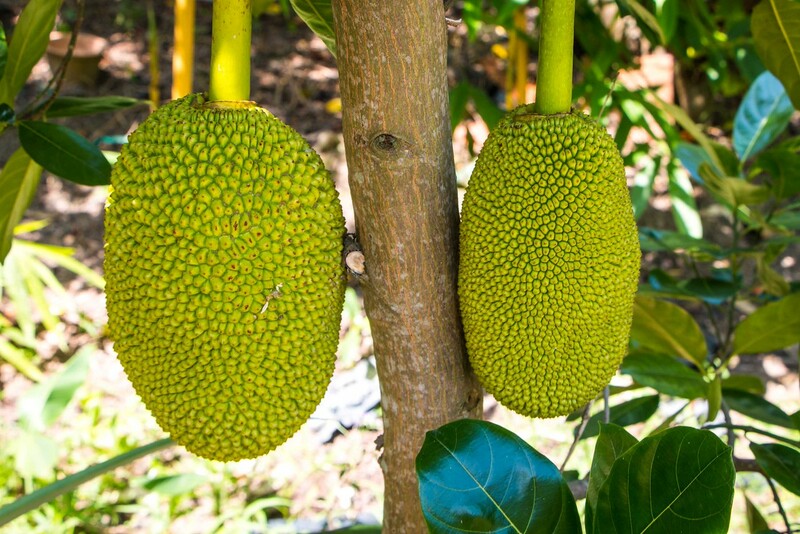 Just under one of your fruit picture you wrote Durian for a Jackfruit (jacquier un french). This is so helpful! Finally planning to visit the Delta and I can’t wait. Your photos are stunning. Thank you Emily! Glad to hear we’ve been helpful 🙂 Enjoy your trip! Amazing pictures and lots of helpful information. Thank you for sharing! You’re welcome Agata! Glad to be of some help 🙂 Hope you have a wonderful trip! Awesome post! This is going to be really helpful when we head to Vietnam in 2 weeks. We are wanting to work our way from HCMC to Phu Quoc from 18 Dec to 23 Dec and then have 3 nights on the island. Just wondering how you got from Can Tho to Phu Quoc as I can’t find that info in your story? 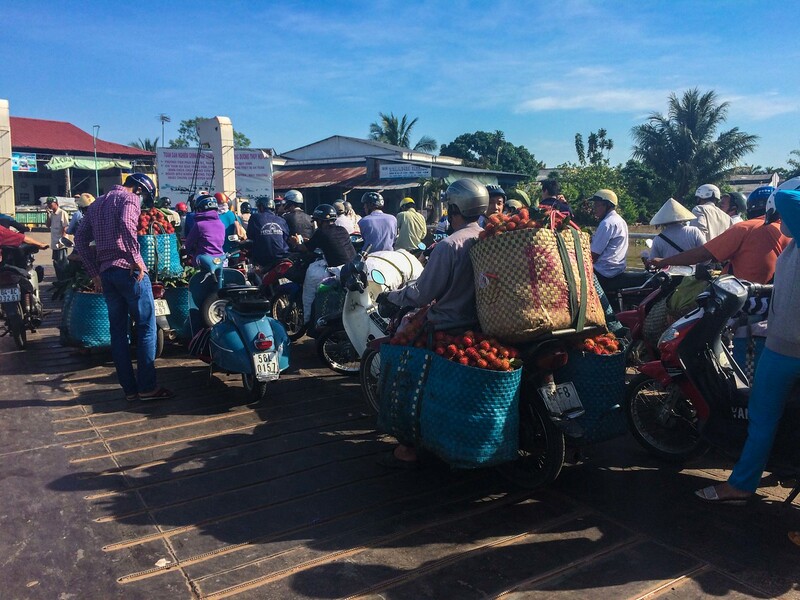 We are flying out of Phu Quoc and wanted to get a ferry from either Rach Gia or Ha Tien so needing to work out the part from Can Tho to the coast as we want to make it part of the trip and not just one long commute. Hi Gila, thanks for your comment! Glad to have helped you plan your trip it sounds so exciting! With regards to how we got from Can Tho to Phu Quoc, we ended up flying directly from Can Tho airport which was nice & easy 🙂 We’d originally planned to do what you’re thinking – i.e. bus to Rach Gia or Ha Tien then ferry, but this worked out so easy & wasn’t too expensive. Hope this helps & that you have a wonderful trip! Love the post and all your gorgeous photos! 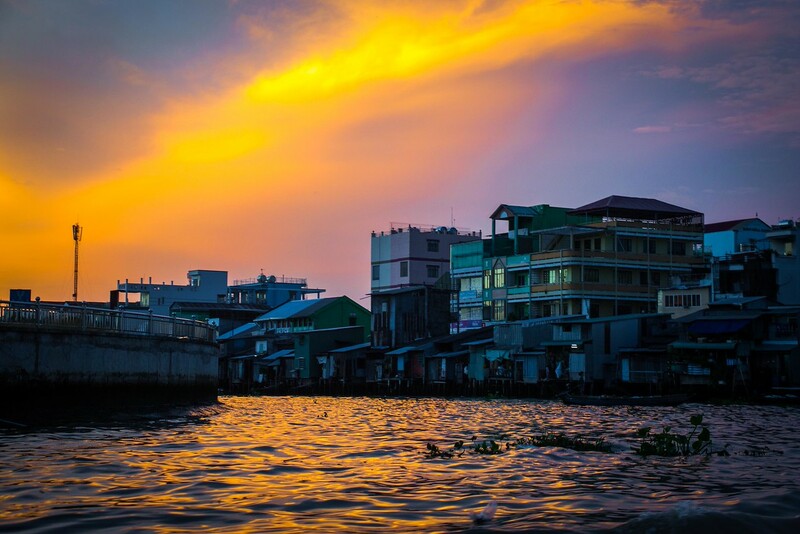 I am headed to Can Tho in a month and was hoping you could recommend your hotel/homestay and your tour company for the markets and the waterway afterwards!? Hi Lindsay! 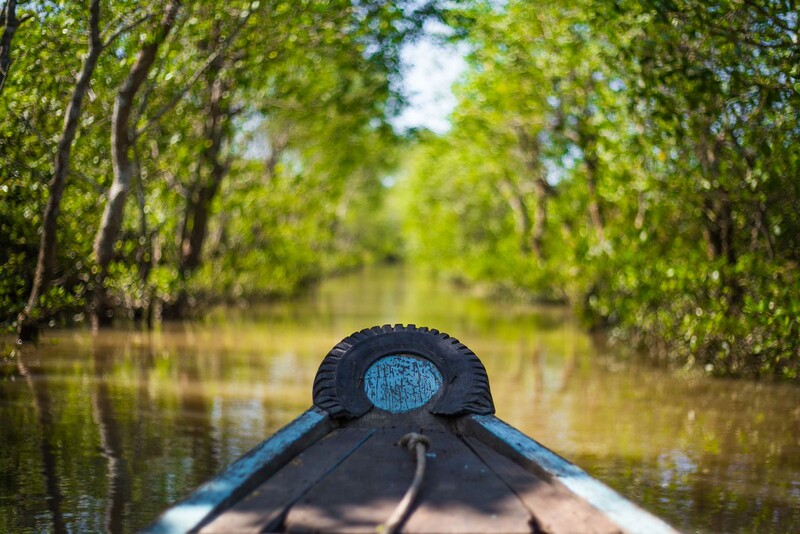 Thanks for your lovely feedback 🙂 How exciting that you’re going to the Mekong Delta next month, we hope you have a wonderful time! For Can Tho, we stayed at a lovely homestay/guesthouse place called ‘Thanh Ha Guesthouse’. It is owned by a lovely kind lady called Mrs Ha and we’d definitely recommend it. It’s very reasonable, comfortable & clean and her breakfast is great with another major bonus being that she also arranges great boat tours. 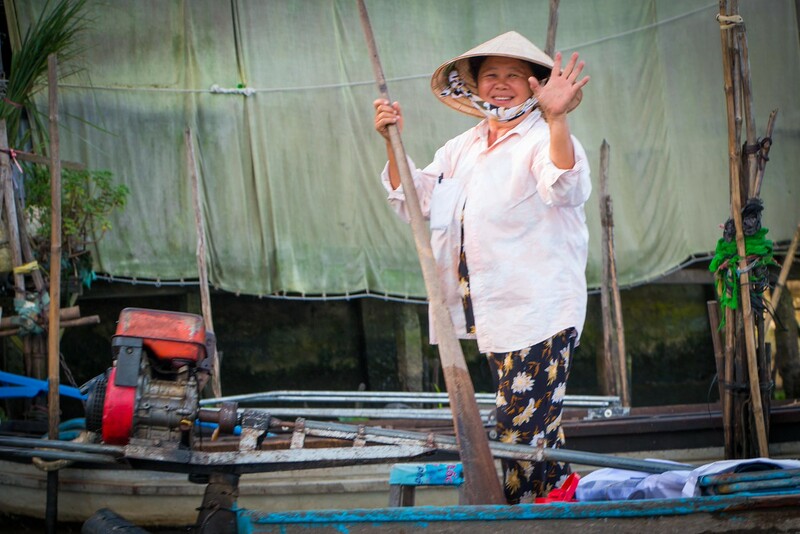 Her niece was our tour guide and gave us an amazing tour of the floating markets and surrounds of the river. Hope this helps! Have a great trip. 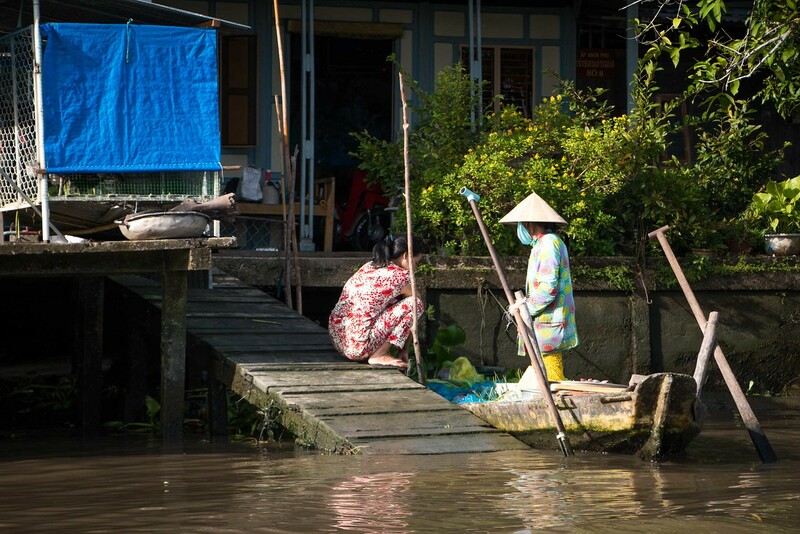 My sister and I are heading to Vietnam in 2 weeks and the Mekong Delta is a must do. I was particularly interested in getting a feel for the duration between cities and your site is very helpful. We fly into Hanoi and will spend a few days in the area before going to Hoi An. There doesn’t appear to be any flights between Hoi An and Can Tho so we’ll do out best to get into Ho Chi Minh City as early as possible. I was trying to do a Ben Tre, Vinh Long and Can Tho loop in 3 days, sadly we don’t have a week. Not sure if that’s too ambitious, would appreciate suggestions if any. Hi Anna, you’re very welcome! How exciting that you’re going to Vietnam! We just love it and would return anytime in a heartbeat! With regards to any suggestions, I would firstly say don’t try to do too much. Make sure you still have enough time to travel, recover and enjoy each place you visit, however I also totally understand you wanting to cram in as much as possible – it’s a tricky balance! I would say that 3 days is quite tight to cover the 3 different places in the Mekong Delta, as there is a few hours travel time in between them (depending on how you travel of course but by bus will take some time) so perhaps it might be best to choose 2 of out those 3 places to allow enough time to travel and also take the tours in each place, or experience the homestay (e.g. in Vinh Long) if that is your plan? 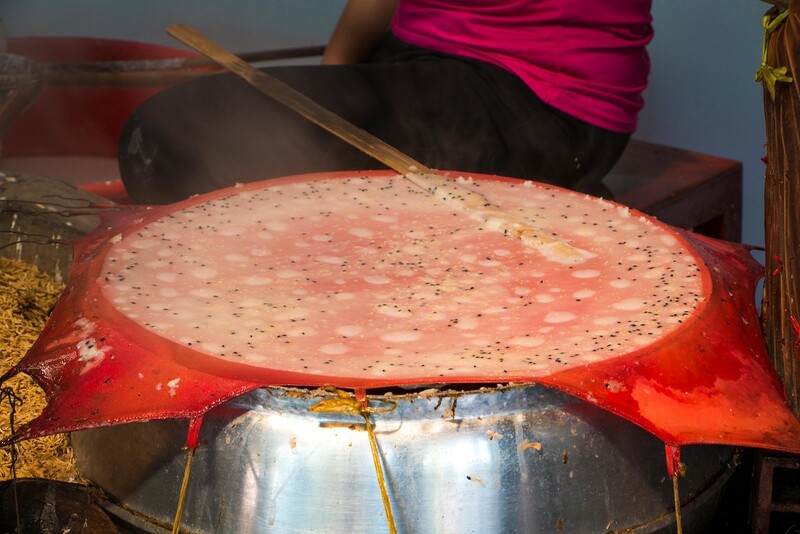 Ho Chi Minh is also a great city so your detour there can also be an interesting stop for incredible food, markets and some history (e.g. the Vietnam War museum, cu chi tunnels or just walking the city). Hope this helps a little! Feel free to get in touch for any more info. Wishing you happy & safe travels!